Call me crazy but I shall be restarting the challenge. 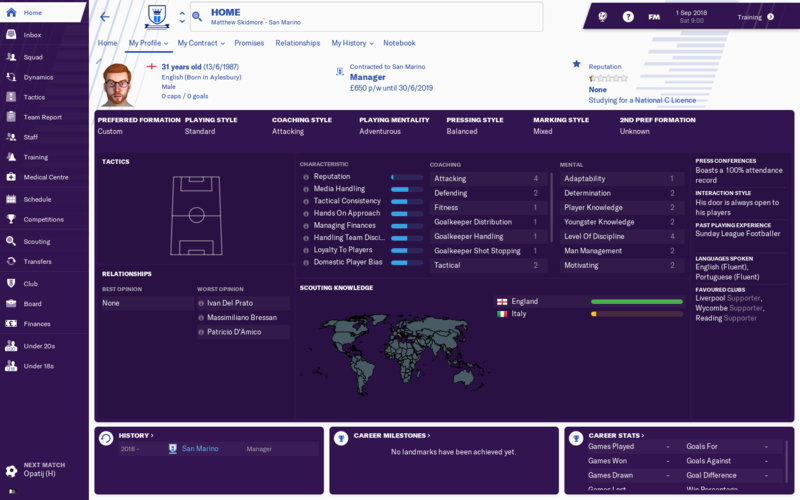 The issue with the Domestic league Download has really bugged me as I really want to manage there. 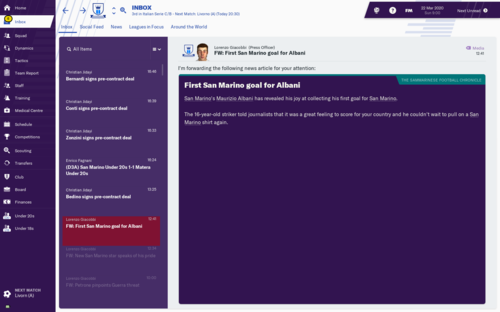 I will be posting here again but will be managing both San Marino Calcio and San Giovanni from the start. This time around I will be using two database add ons by @claassen. I'm playing with the excellent claassen's updates and league prize for winners in SM is 30k euros, not sure it makes much difference tbh . You sure you want to restart for 30k per year??? Initially it won't make a great difference, but correct me if I'm wrong, the prize money should be directly linked to the UEFA league rankings and should rise as/if the league rises. It's little details that really bug me. I've not deleted the 1st attempt so have a chance to carry on if I can't get into the new save. I'm pretty sure league prize will stay the same regardless of ranking or reputation. Only way to make serious money will be a decent run in european cups, with CL group stage as the ultimate jackpot. 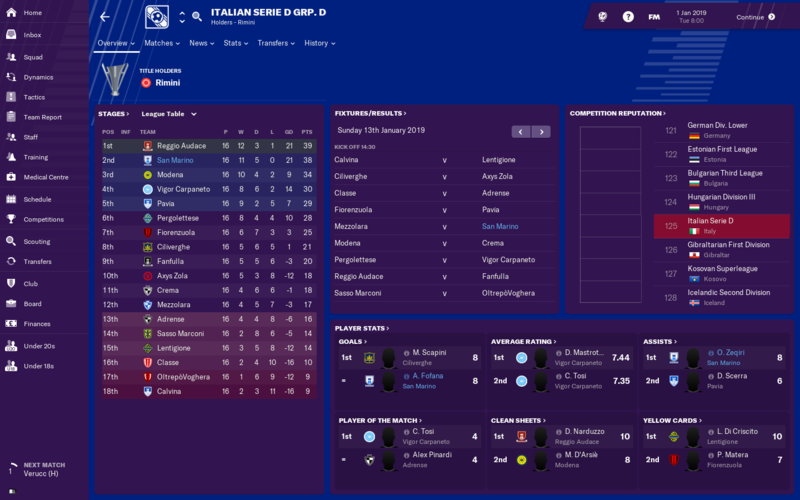 I do understand your frustration though, claassen's updates are top notch, I'm using his Serie D + Campionato Sammarinese (not managing there, just in case...) and the level of accuracy of format is nuts! 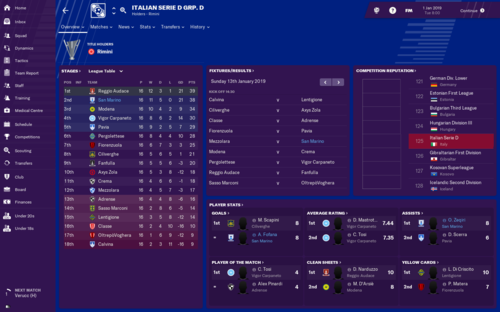 Currently cruising in Serie C - and also just conceded a cool 11 goals in a qualifier against Croatia . I just remember from reading @Bedese San Giovanni save, the prize money rose as the league did. Im gonna have to go back and check now. Sounds like good progress is being made then, any decent HG players yet? Looking back it may have been Rankings linked to TV money, however the DB im using now, ive earned £22k from TV money in 3 months, earned £0 on the other DB in a season. I don't remember league prize ever rising in any league I've played in FM but can't be 100% sure! 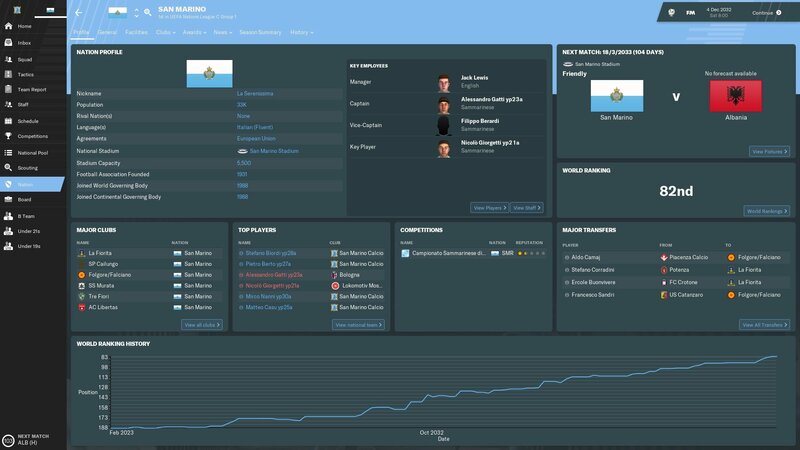 I'm in the middle of second season a couple of months away from next youth intake. Best SM prospects so far are the ones I had posted earlier in this thread - curiously both produced at other clubs (Udinese and San Marino Academy). Yeah its more than likely the TV Money that rises then im hoping. 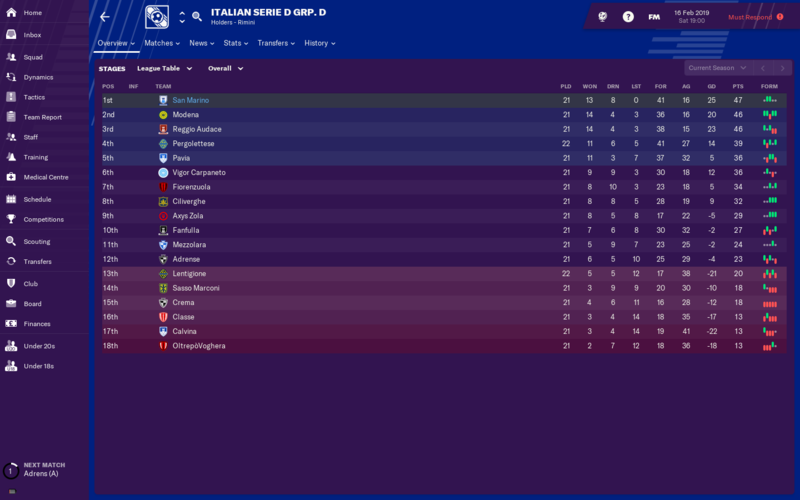 Im 8 games into the Serie D save and going strongly. 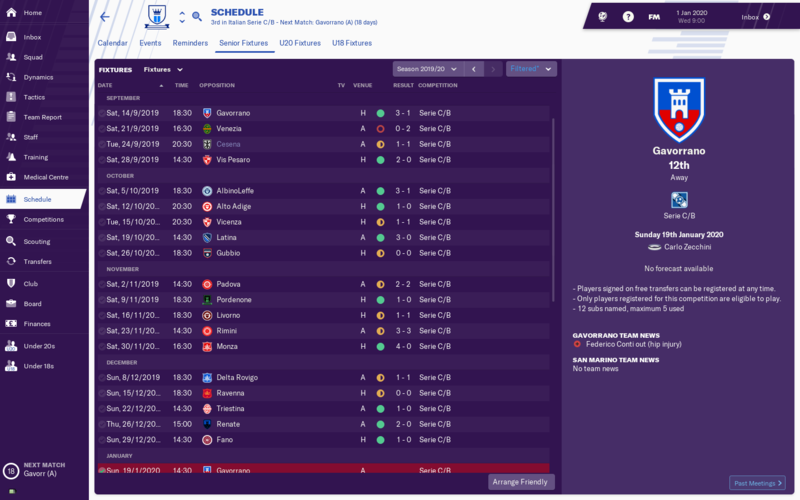 No work for 2 weeks so hoping to get a fair bit into the save. 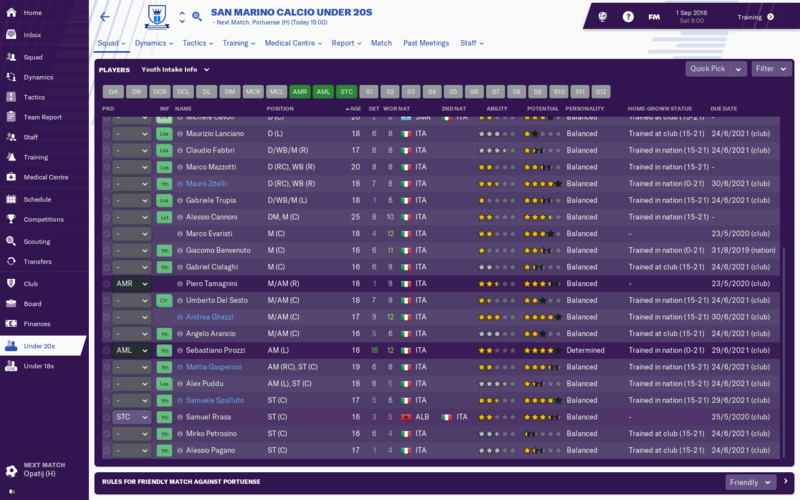 Ill be keeping an eye on San Marino Academy as I wasnt aware of them until you mentioned them. 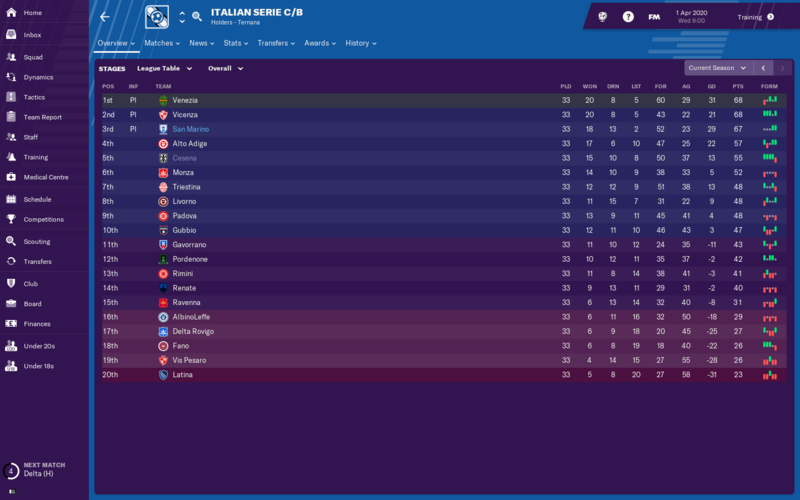 A bounce back year for us, walking the title just missing out on 100 points by losing at home on the final day to Inter (I was pretty annoyed at this). Mauro Righi (who unfortunately finally got cap-tied by Italy) won the Capocannoniere for the third year in a row, and the two new Croatians we signed in the summer were both excellent. 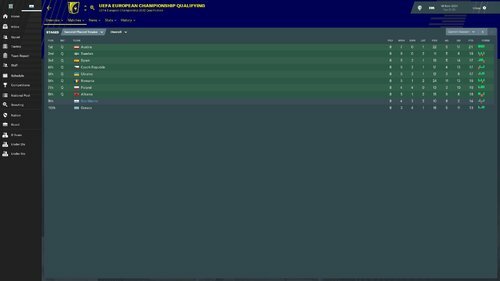 In the Champions League, we finished second in our group despite accumulating 15 points, getting edged out on away goals to Liverpool. 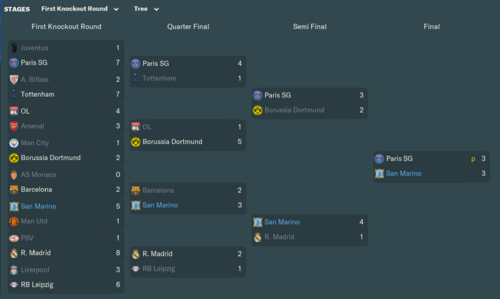 In the round of 16 we drew Bayern and lost in extra time, after a great second-half second-leg comeback where we scored 3 goals in the final half hour just to push it to extra time. In the cup we lost in the QF away to Torino, which was probably the most disappointing result of the season. Also we lost the 4th Champions League place again to France. 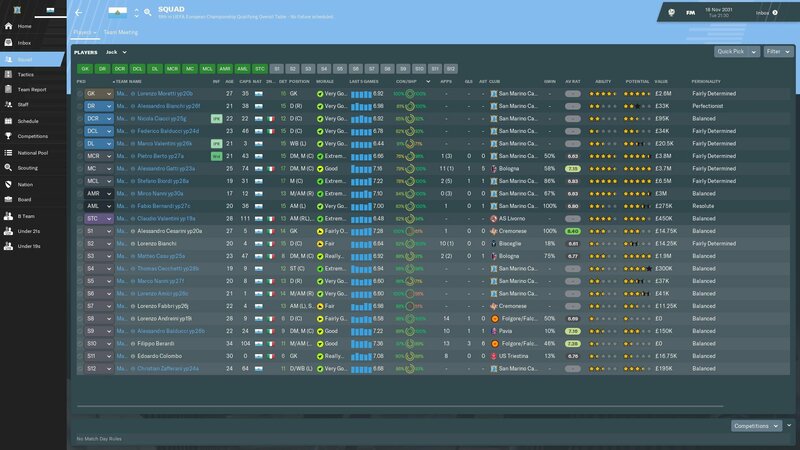 Ciacci looks awesome (and Sammarinese only), but unfortunately I didn't really need another goalkeeper for the National Team. Gave him his first cap against China in a friendly in June. Rest of the youth crop this year is pretty average. Another productive year for the National Team, including what was by far our best ever result and performance, a 0-0 draw at home to France in which we were well worth the point. 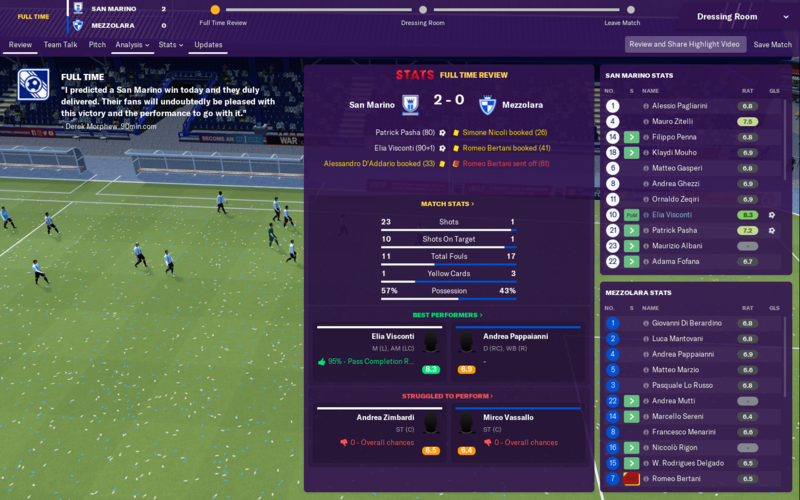 Both sides had chances and it could have gone either way, and in the end we had to survive a late barrage after a dubious red card with 10 minutes to go. But overall I was absolutely delighted at how we went toe-to-toe with a top national team. Elsewhere in World Cup Qualification, we won away (luckily) and at home (comfortably) to Cyprus, so 7 points in 3 games puts us in pretty good shape. 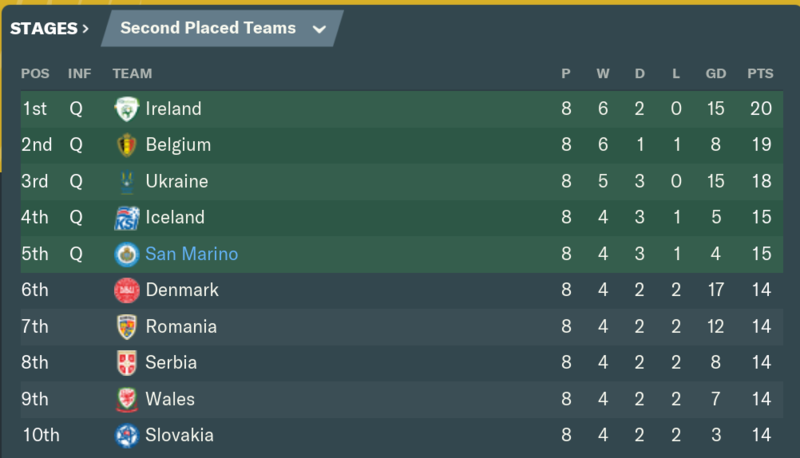 It will still take a miracle to qualify (probably need to win at home against Norway and get two wins over Bosnia to have a chance), but we're doing as well as we could up to this point. 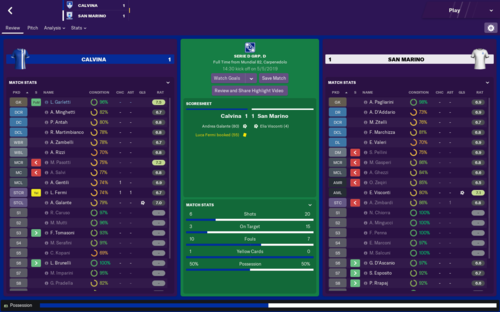 In the Nations League, our performance was pretty bad but we still managed to squeak top spot by beating Moldova at home on the final matchday. I'll be disappointed if we end up yo-yoing a bit, because the timing is off with Euro Qualification unfortunately. I might've even preferred not to get promoted, but that might've also cost me the national team job. So normally I would wait until the end of the season to post an update, but this just could not wait. 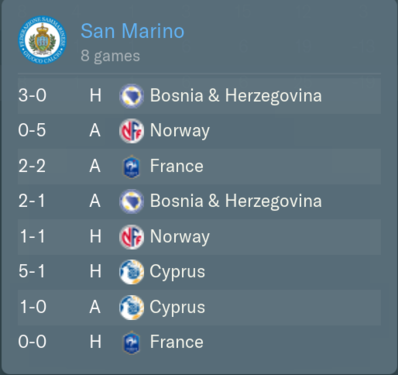 San Marino have qualified for the 2030 World Cup. I thought it would be at least another decade until we would challenge for tournament qualification, but we defied the odds and barely made it as one of the second place teams. Our world cup group comprises Australia and Senegal, so while we avoided any world beaters, it will still be tough to advance to the round of 32. In our starting 11, we have 1 leading Serie A player, 3 Good Serie B / Decent Serie A players, 3 Serie C level players, and 4 Serie D level players, so still a lot of weaknesses in the lineup, particularly at left back where we still call up a defender from the Sammarinese league even when everyone is healthy. I actually thought there would be world cup playoffs instead of this nonsense (I don't recall this rule being present IRL for world cup qualification - but perhaps they are changing it for 48 team world cup), so to actually secure qualification was a nice surprise. To be perfectly honest, I think this was more an aberration than anything, as we were extremely fortunate in a couple of the games. The only games we deserved to win were at home against Cyprus and Bosnia. We definitely deserved the home draw vs. France, but should have lost at home to Norway (though a draw wasn't THAT lucky), should have lost away to France and Bosnia, and probably should have drawn away to Cyprus. So I'd say we deserved only 8 points instead of 14. The sobering 5-0 defeat to Norway shows there's still a long way to go. However, this is my first time qualifying for a major tournament ever with the San Marino challenge (did it once in fm 16 or 17 I think without any qualification), so this is still a great accomplishment. The away game to France was insane. We scored on our only shot in the first half, going into halftime tied 1:1. They get a 60th minute red card - we score against the run of play to make it 2 - 1. In the 90th minute they have a corner kick, and I'm about to sub in my tall striker for defending it, only at the last second to cancel the substitution, as they say you shouldn't make a substitution defending a corner. And of course they score on the corner :(. Luckily it didn't make a difference in the end, but that would have been so sweet. 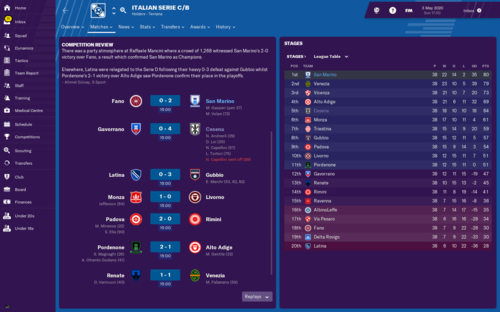 The old serie C treble - League, Cup and Super Cup! 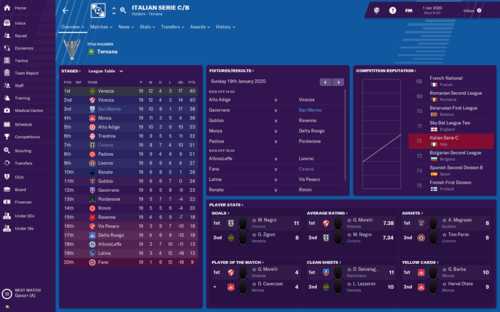 Won every competition we played in comfortable fashion, squad had both quality and depth thanks to some good signings on free (including top scorer Spagnoli and POY Pugliese) and excellent loans (mostly from Palermo). Back to back promotions to serie B accomplished, going for the three-peat now . After a good nations league, NT had a terrible year in EURO qualifiers with a string of heavy defeats. Biggest success of the year was Udinese starlet Stefanelli accepting the call-up (and also a loan to our club) which is cool. Youth intake was again disappointing and for the second year in a row the best prospect was a goalkeeper (both just half decent, maybe good for third choice atm). Still a long way to go! Could you show the stats of Stefanelli? I arranged a two years loan mainly for two reasons: 1) lower his reputation (and self-esteem ) and become his favorite personnel so that he'd be more inclined to accept a call-up for NT 2) work on his unambitious personality via mentoring (I have some very good mentors at his position). First task was successful, second one not so much! His personality is harming his overall development at this point, hopefully things will change soon. Other 'top' prospect Reggini is developing decently and scored tons of goals with the under-20 though he's currently second choice for NT behind 'real' player Nicola Nanni (a pretty good young player for SM standards). Still a welcome 'external' addition to the squad from the mighty San marino Academy . Pretty good player - really love him. My 3 best winger/attackers are all +32 years old - so i really needed a new star for SM. Do have 50% clausul for next transfer. Also damn good - many years to come from him. Also have a 50% clausul of next transfer. Same for this guy - hopefully goalkeeper for next 15 years. And hopefully my next start player . We are number 83 on the world ranking right now. But i only use players from own youth intake - so im struggeling to stay in Serie B - but i develope some pretty good players. 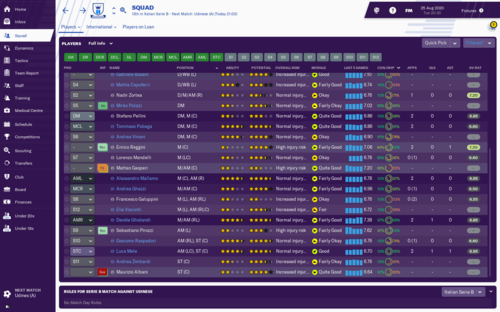 I loose around 15 mio dkk each year - so i really have to sell some good players or hope for money from my clausuls. Which means i get some pretty decent players most YI. 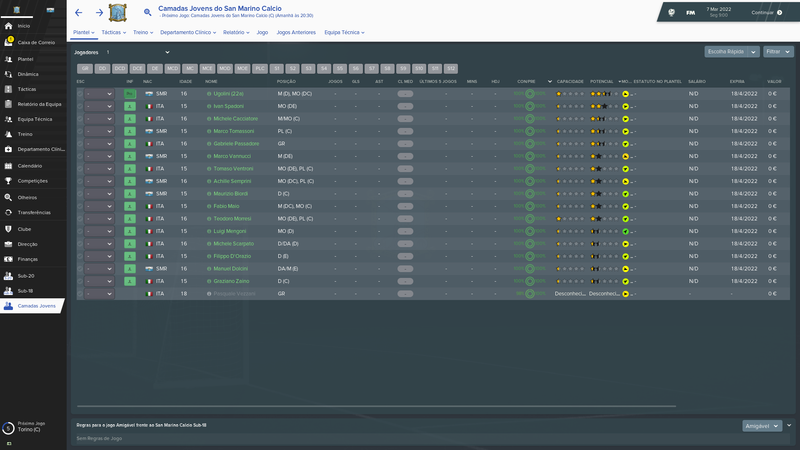 Haha - if seen that some of my players later in their career go to the Australian league - but look at their national team. Must be some kind of bug - but pretty funny. All players started their career in Italy - with only italian nationality. Even one of my regens made it to the Austrailian nationalteam. Crazy! But maybe they got Australian nationality after playing 5 years in the country? They all play in A-league and all around 30 years old so that could be the case. Curiously in my save SM star player, winger Filippo Berardi, also joined an A-league club (Western Sydney) which was cool so I didn't have to rescue him and sign him for our club (already signed GK Benedettini as a back-up just to keep him in the game!). 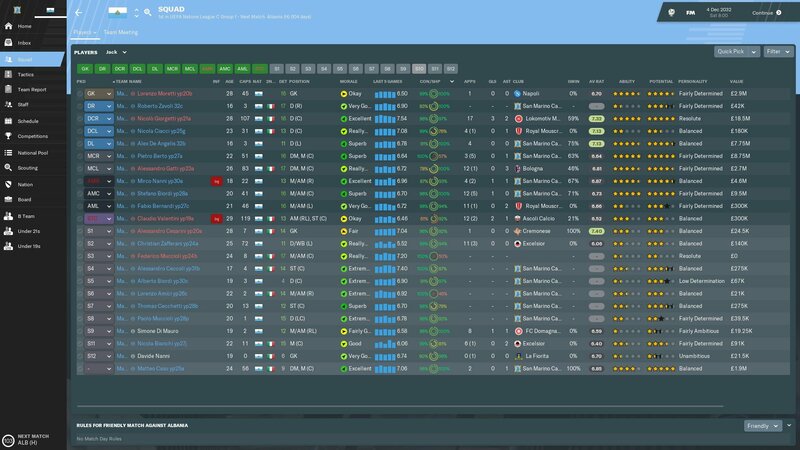 A-league apparently craves Italian players - and Sammarinese too! Yes - they only have to be in Australia for 1210 days. When i talk about a bug - i mean that the australian clubs sign so many italian. Haha - Filippo Berardi also changed too Western Sydney in my save - and i had to start the challenge 2 times - because of a bug - but both time he went there. 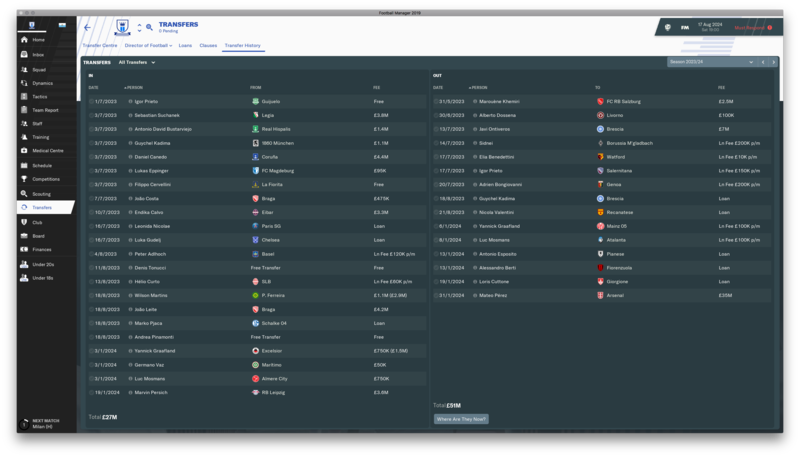 At that time i only had the italian and sanmarinese leagues loaded. If i added some leagues now - and will se if the trend continues. 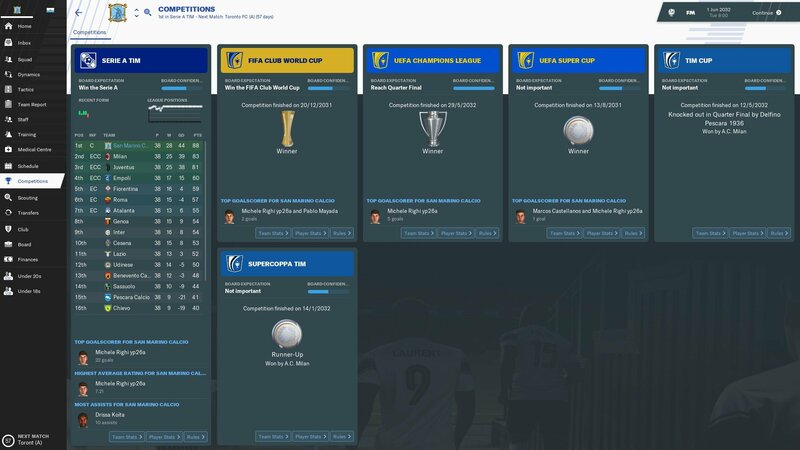 This was the most fun season I've had so far in terms of a title race. 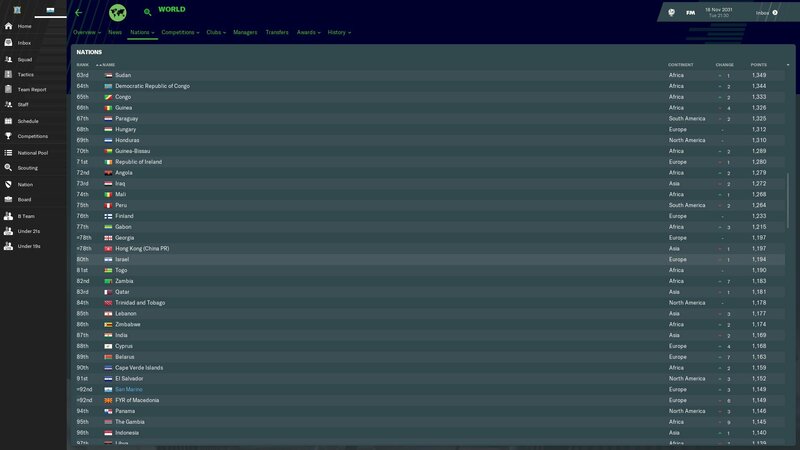 Palermo of all teams led the way for most of the season, but we overtook them with 4 games to go and never looked back. Inter, Napoli, and Juve were all in the mix as well. In fact, due to a shock home defeat vs. Sassuolo on the penultimate matchday (a win would have clinched the title), we entered the final matchday having to go away to Juventus and get at least a point to win Serie A (a loss meant Juve would have overtaken us). 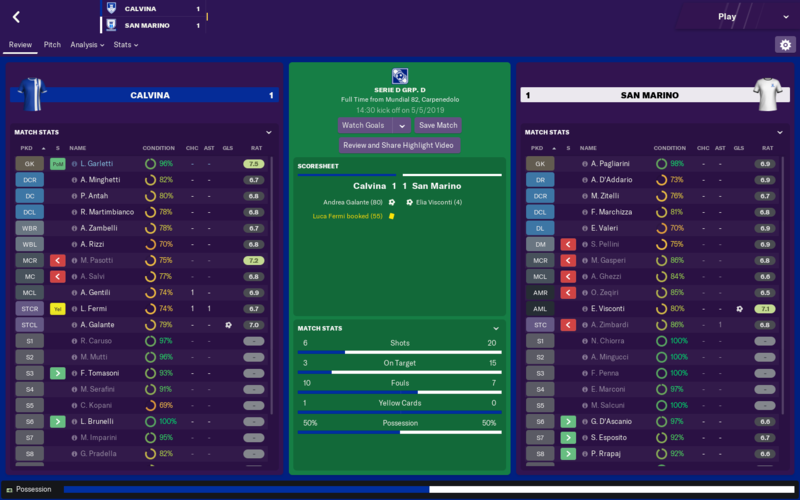 Not only did we draw, we got the victory, with César Gelabert, playing in his last game for San Marino Calcio (he's off to Russian Club Ural in the summer after having complained about playing time), sealing his storybook ending to his time at the club by scoring the only goal to secure our 4th Scudetto in 5 years. In the Champions League, we easily qualified from a group with Monaco, Athletic Club, and Fenerbahce with 16 points. 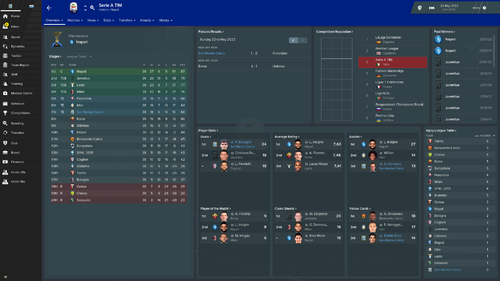 Beat Liverpool 1-0 on aggregate in the round of 16 before being smashed by Man City (again) 7-4 on aggregated in the QF. The English teams in my game are just too strong - in the past 12 season only one non-English team (PSG) has won it, and the last 3 years were all won by Manchester United. 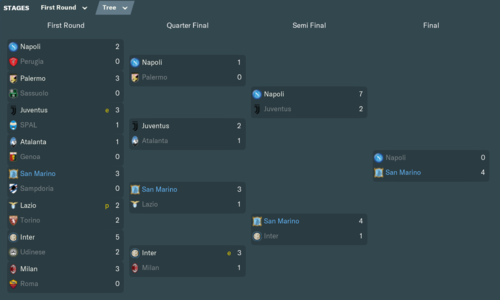 In the Coppa Italia we lost to Palermo on penalties (I think this was our 4th or 5th QF exit in a row), and we also lost the Supercoppa on penalties against Juventus. Both games finished 0-0 after 120 minutes. Also, Italy regained the 4th Champions League place again to France. I think is the 4th or 5th season in a row where we flipped it back-and-forth. The World Cup went reasonably well. We drew both our group games against Senegal and Australia by a scoreline of 1-1, qualifying second from the group behind Australia. 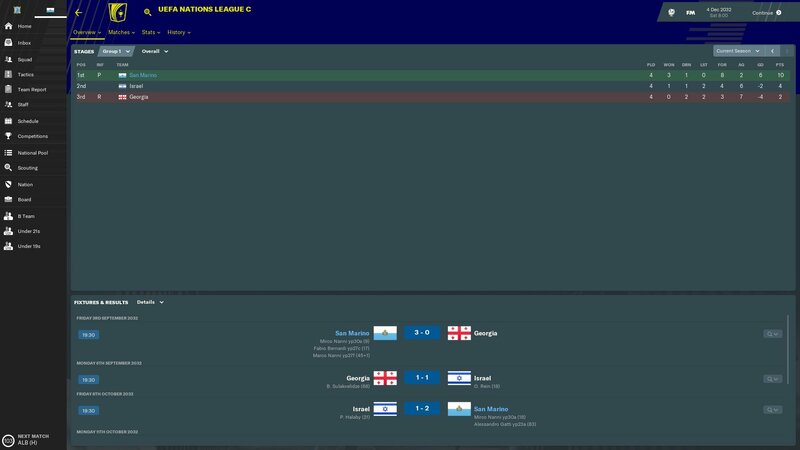 Unfortunately we got played off the park by Italy in the round of 32, losing 3-0 (I don't think we even mustered a shot on target). 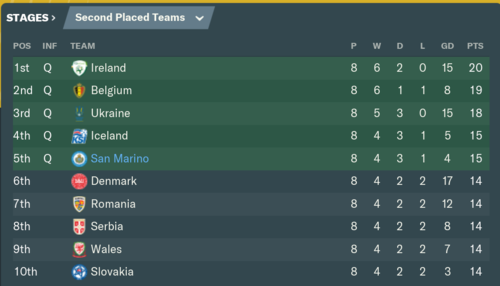 In the upcoming Nations League, we got a fantastic draw, drawing Albania and Finland in our group, so I think we have a real shot at back to back promotions. 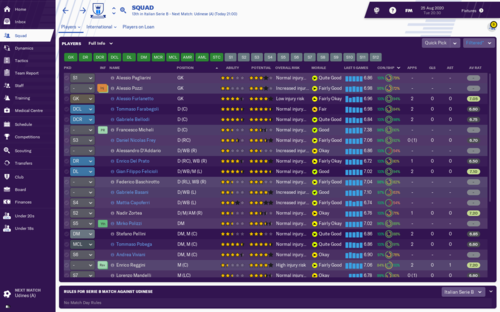 Wow - Serie D to Serie A in 3 seasons. Very impressive! Cheers man. Didnt manage it first attempt so glad to do it this time around. 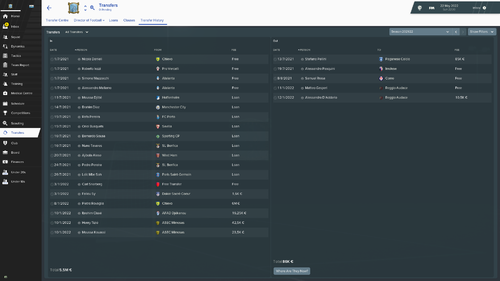 Half way through first season in Serie A and we are bang in a relegation fight but making £2m a month almost. If we can stay up, should have a decent budget to spend next season. Serie A, hang your head in shame. We won the league. 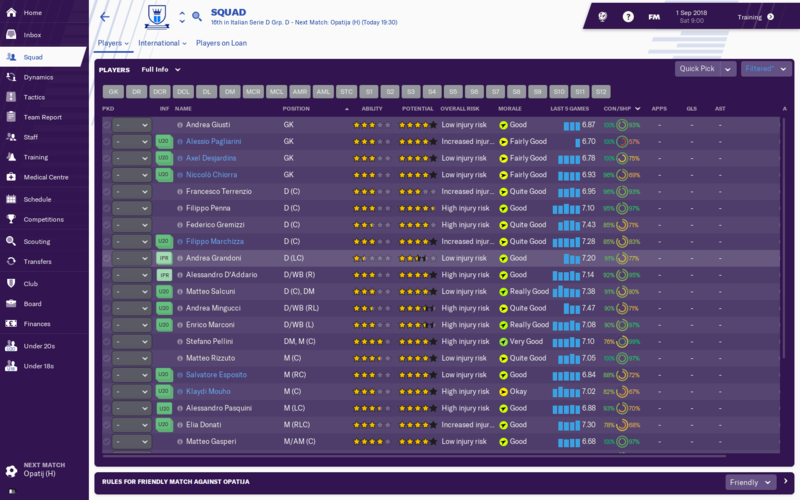 Don't get me wrong, we have some good wonderkids (some permanent and some in on loan), but there's no way we should have finished top of the pile. A few early losses pointed us in the direction europe but a solid run after that had us just behind Juventus for most of the season. A mid season blip of draws against lower league opposition saw us fall further behind, but an almost certain CL qualification spot was in the bag. This was until Juventus decided to lose 5 of their last 12 games (one of them to us) to let us back in. 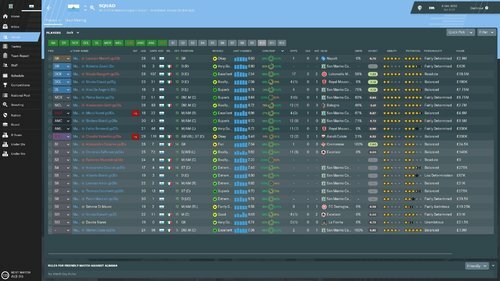 We nearly blew it in the penultimate game of the season when we lost 2:0 to Palermo, but Juve lost their tie to a lowly Spezia that weekend too. 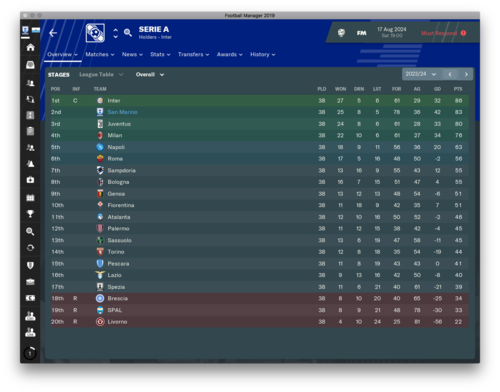 We went on to beat Spezia at home last game of the season to clinch an unlikely title. On a sour note we lost in the first round of the cup and only collected one of the six points I wanted as revenge against Roma. Another good year in terms of upgrades. Won't be too long before we have state of the art facilities. Still only an established youth recruitment rating though. I really want to try and get San Marino Academy as a feeder club but they keep rejecting any advances. The new 17,609 seater stadium is being built and we move in at the start of the 24/25 season. 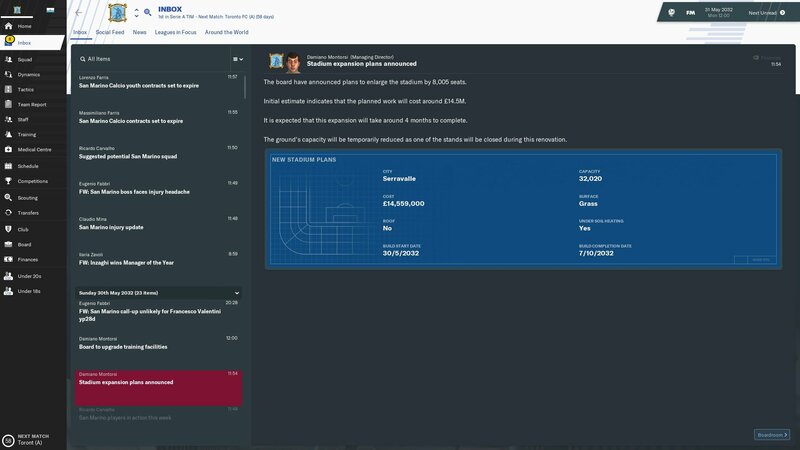 It took a chunk out of the pot but we're still doing well with £18m left in the bank and a £7m transfer budget/£354k p/w wage budget for next season. Another beast came through but has the dreaded duel nationality and is rejecting call ups. That's three of them now. The keeper (Muraccini) shouldn't be good enough for Italy but the striker (Guidi) and new defender (Poggiali) might actually get there. 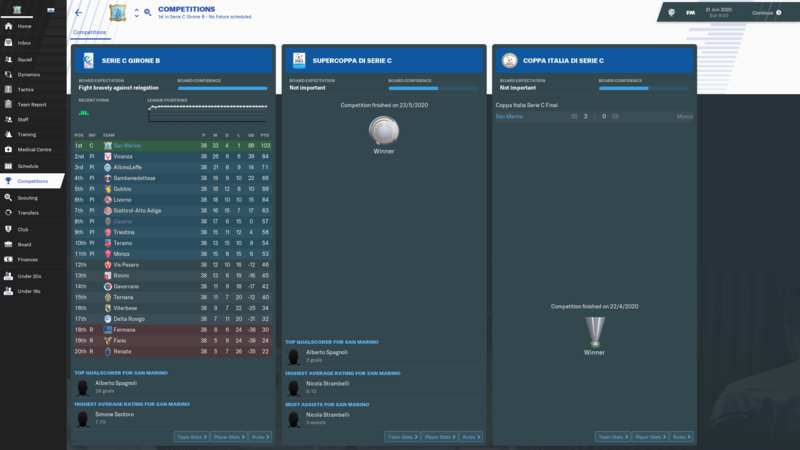 CL qualification and to finish third in my CL group to get into the knockout rounds of the EL. We finished second in our International League D having picked up one win and a loss against FYR Macedonia, Azerbaijan and Lithuania. 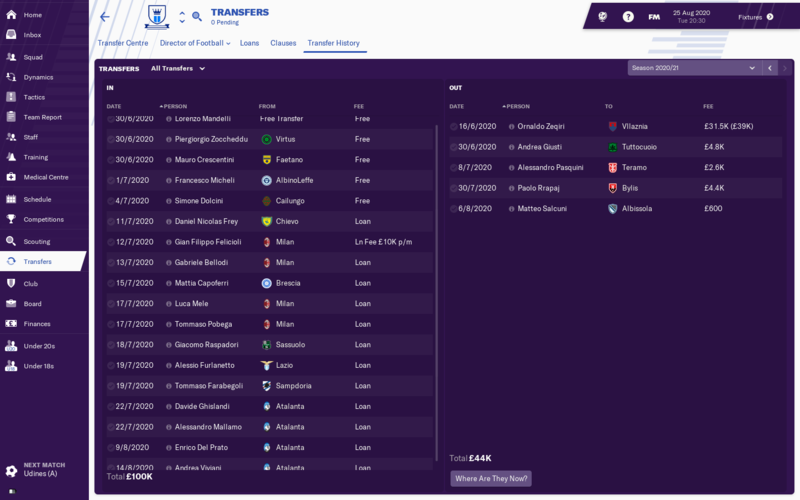 Most players are newgens now (Filippo Berardi and Elia Benedettini have actually got worse over the years, which is a bit damaging), but we're heading in the right direction. Elia Tomassini should be given the freedom of San Marino. As well as banging them in on the international stage he also scored 4 Serie goals (from the bench) last season. Hero. I'm now in the 4th season so will give a quick run through the first 3. From now on will post a season review. Sorry for any mistakes as I'm portuguese. 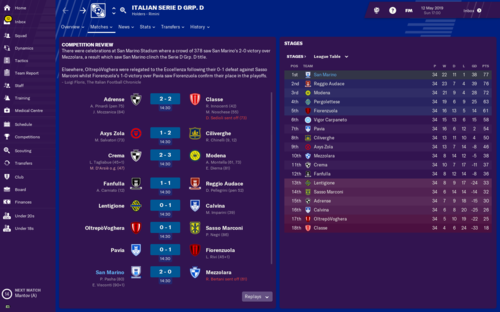 Starting in Serie D Cup a early exit in 2nd round on penalties. A bit disappointing, still messing around with tactics but was not our primary focus. 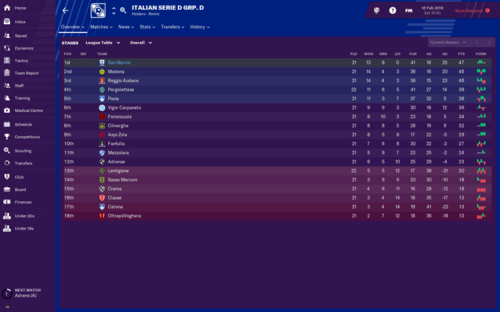 Manage to win Serie D Girone D by a point even with just 5 defeats all season. Unfortunately lost in SF of the Poulle Scudetto. Some loans but mainly freebies. Ronchi is a good GK, Zemelo and Torta were also good. Caniggia was easily our best player and Diawara also really important. 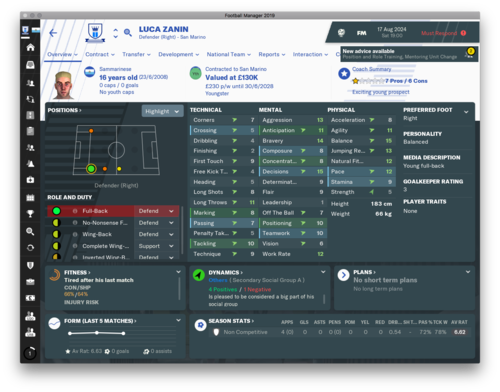 Best player was an Italian but got 3 Sanmarinese who can turn out ok for NT and a potential good keeper with double nationality. Another early exit from cup after a win and a lost int group stage. In the league we did OK and got qualified for the play-offs. After two comfortable wins in the first 2 rounds, met Virtus Entella and was by far the most difficult round after losing at home. Both Ternana and Juventus U23 gave us no problems keeping 4 clean sheets and we round it off with another comfortable win against Novara. 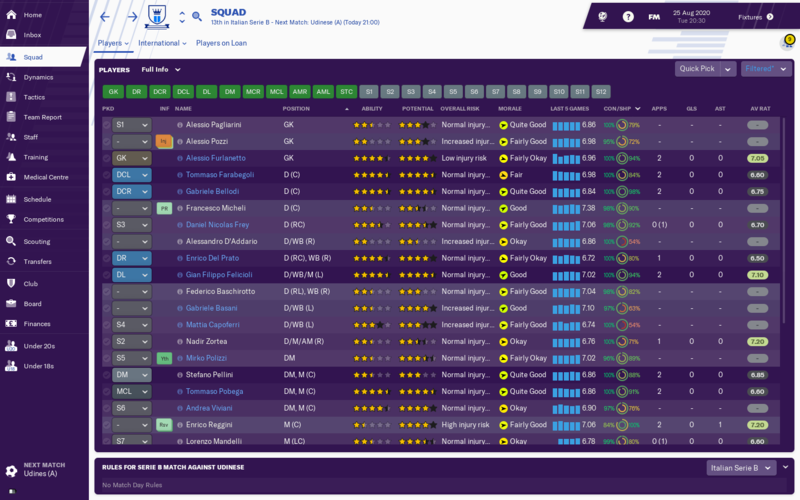 We build a good squad with lots of loans on low-to-no wages. Only one player stood out, maybe the best so far. 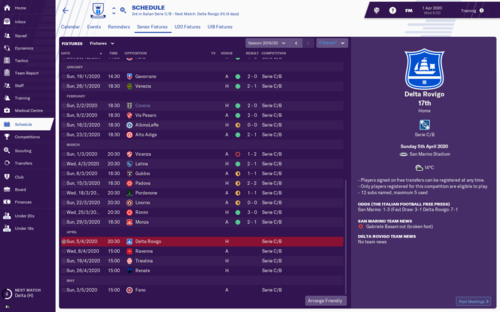 Yet another early exit from cup after a 3-1 defeat against Udinese. Life in Serie B started with only 1 win in first 4 games, then a good run of 8 wins in 11. December form was poor in another 2 defeats but again we turned things around and went unbeaten for the rest of season (11 wins and 7 draws). So time for another play-off starting with against Foggia (a team I beat 7-1 in the last game of the season) drawing 2-2 away before demolish them at home. 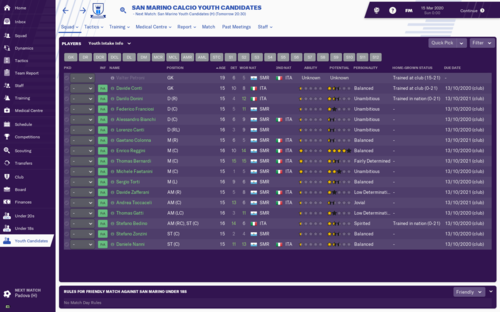 Salertina was the only thing between us and Serie A and was an easy enough final (winning 3-2 away and 4-0 at home). 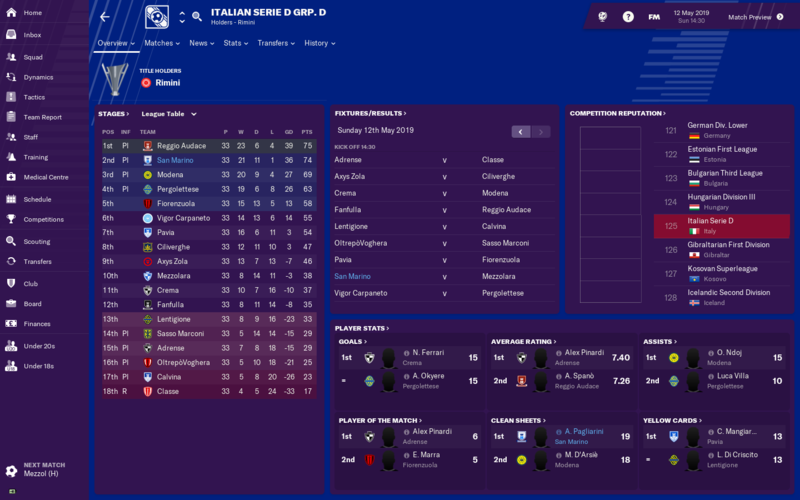 So Serie D to Serie A in 3 seasons, even though only one league won in the way. The strategy was the same: lots of loans. Just an ok keeper this year. What a heartbreaking season. 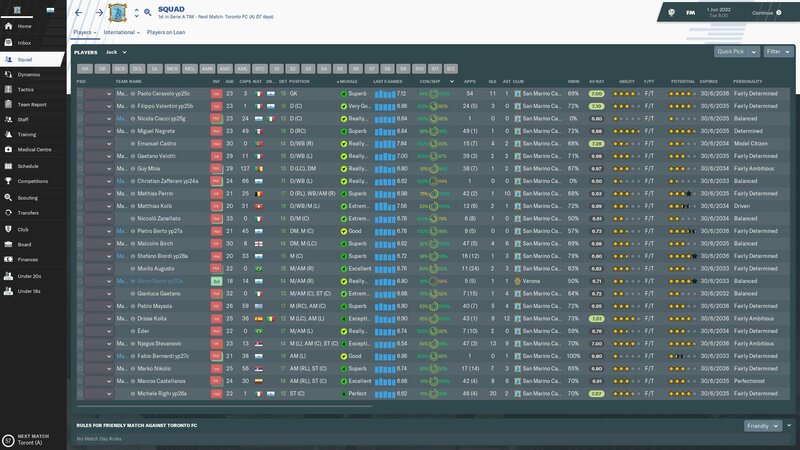 Losing the league on the last day of the season (though I needed Udinese to take points off Milan on the last day which didn't happen), and losing the Champions League final on penalties after drawing 3-3 against PSG in a crazy game, although we did manage to have the first ever Sammarinese International scorer in a Champions League Final. We won relatively easily in the Coppa and also won the Supercoppa. We actually had more points than last season but the competition around us improved as well. 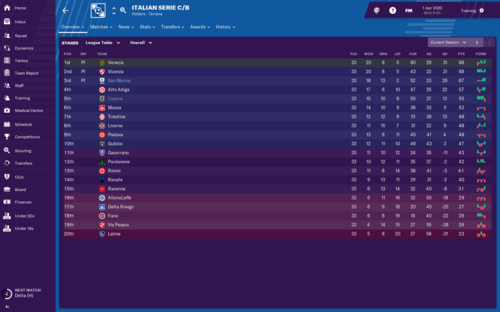 I thought we had taken a turning point in the title race after beating Milan away with 5 or 6 games to go, but we let it slip with a 2-2 draw at Roma with 3 games left in the season. 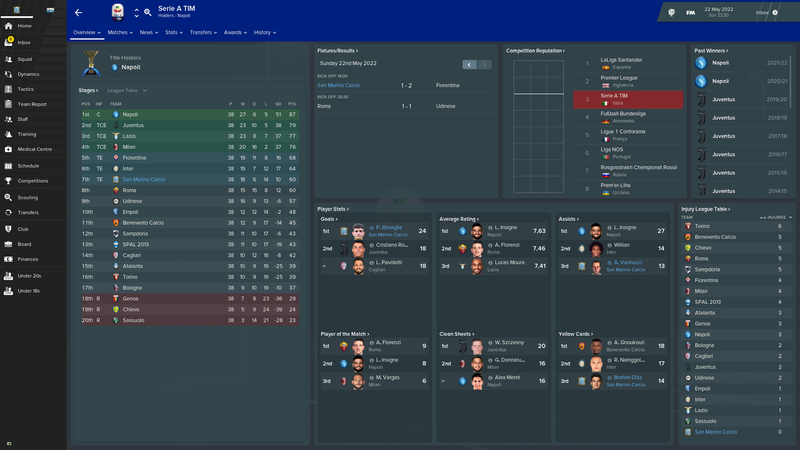 We finished second in our group behind Real Madrid (including losing 4-0 away), beat three-time defending champions Man U comfortably, winning both legs by 2 goals. The QF against Barca was really tough - we rode our luck in the away leg to a 1-1 draw, and in the second leg missed a penalty but managed to win in extra time. The SF against Madrid was the highlight. We dominated the first leg at home but somehow lost 1-0. In the return leg we put up our best performance of the season, romping to a 4-0 win of our own, avenging the same scoreline we saw in the group stage. 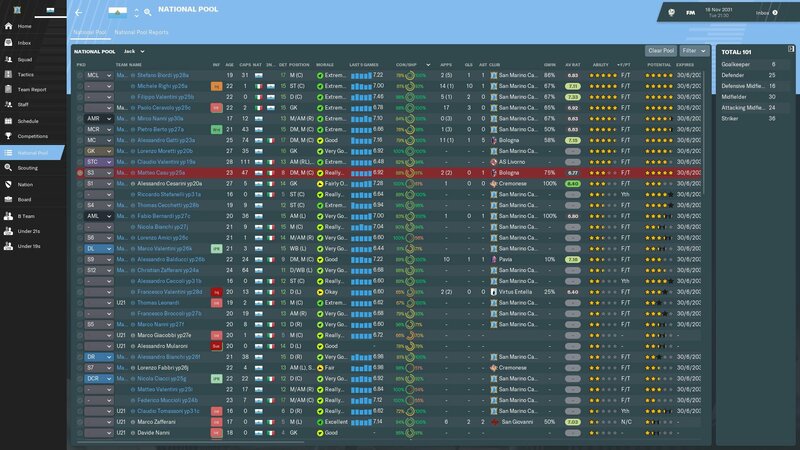 We breezed through this competition for the most part, though after a 1-1 home draw in the first leg of the semis it looked like a tricky return match away to Inter, but we comfortably won 3-0. A really poor year by our standards. 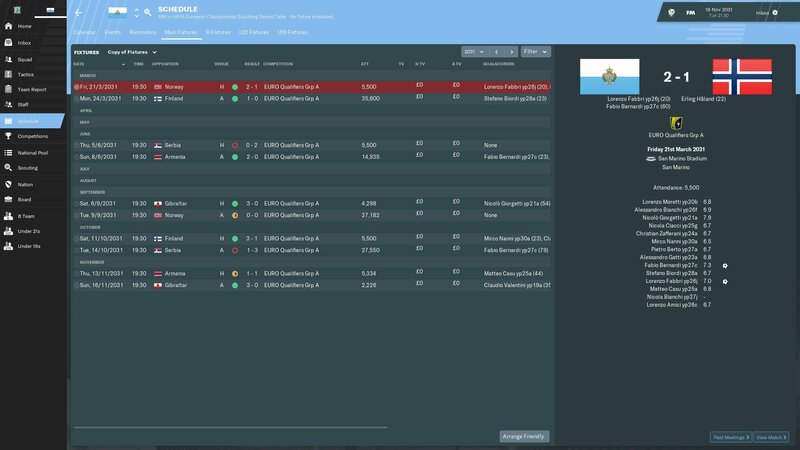 We harbored ambitions of getting promoted in an easy group with Finland and Albania. It started reasonably well with a 3-0 win away to Albania and a 1-1 home draw to Finland, but we lost our last 2 games including getting completely dominated at home by Albania. Injuries to key players definitely played a factor and we just don't have the depth yet to cope. 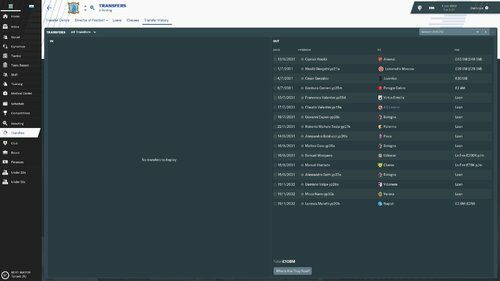 We have a reasonable group for Euro 2032 Qualification, with Turkey, Norway, Georgia and Cyprus. 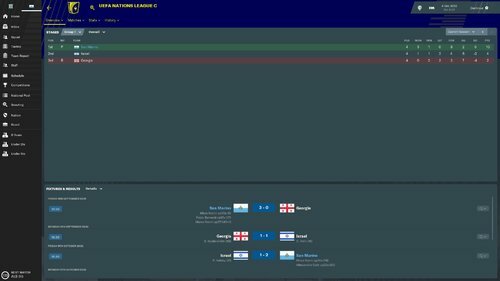 First game was a very unlucky home loss to Turkey, then got smashed by Norway, then a 2-2 away draw against Georgia. So not a great start - it doesn't look like we'll be able to build on our unlikely World Cup Qualification. We got a bit of fortune in Norway losing to Cyprus, so maybe there is a chance of pipping them to second place. 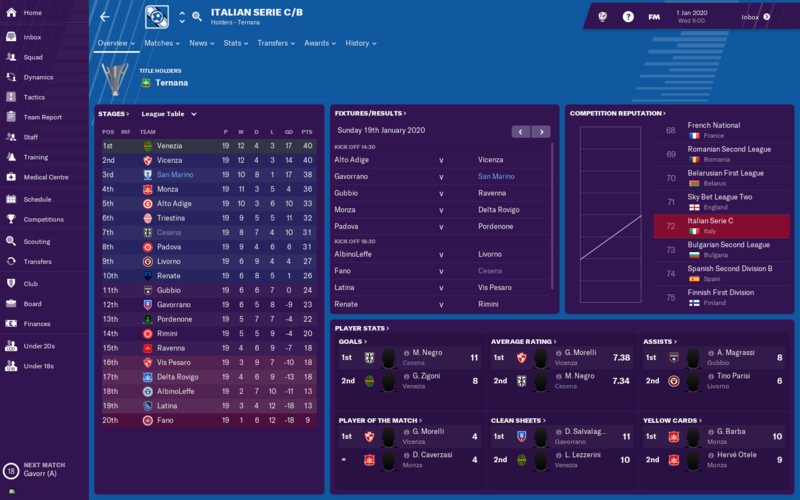 First season in the Serie A was a good one. Once again a early cup exit but Serie A went above expectations finished in a Europa Legue spot. Way to many loans, something we want to change in the near future. Last 4 guys are regens. A bit inconsistent, going from 4/5 wins in a row to not win in 3 or 4 but managed to finish 7th. Rovaglia was Serie A top scorer. Was on loan but bought it for 6M €. Not a good one. Only a half decent winger. Im really struggling to get into the 2nd attempt at this challenge so will be reverting to my 1st attempt. The last season played was this. 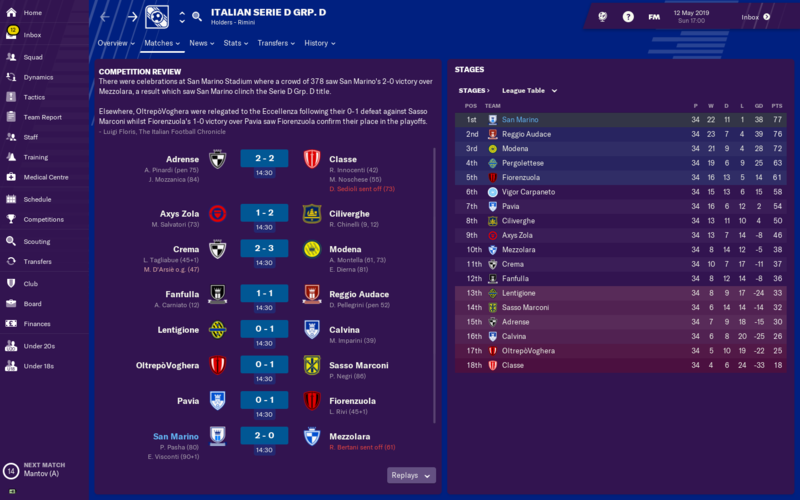 Our ding dong battle with Milan continued this year as we could only manage 2nd place, finishing 11 points behind the league winners. Most shockingly we suffered our worst defeat ever with a shocking 8-2 loss to Roma. 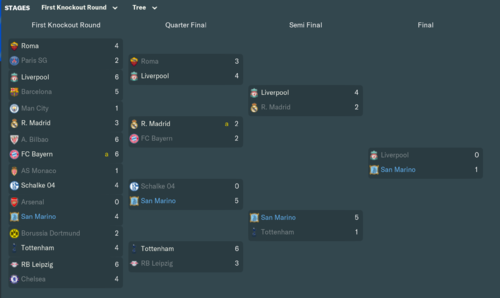 Champions League - Our 2nd Champions League in a row means we are officially a European powerhouse, but what made me most proud this season was the 5-0 win over Basel. With qualification sealed, I played a team featuring 7 youth products and we romped home 5-0. UEFA Super Cup - A game that really could have gone either way, but we pulled through with a 2-1 win over Arsenal. 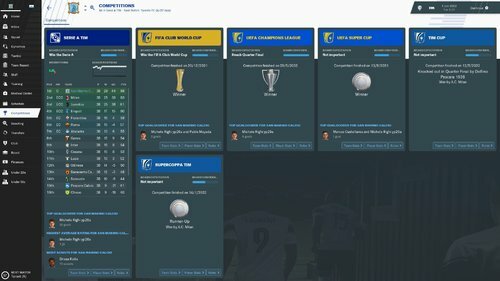 Club World Cup - Our first appearance ended in glory with 2 easy high scoring wins. Super Cup TIM - A 5-2 win over Inter. TIM Cup - Still cant seem to win the cup. Our 2nd final in a row ended with a loss to Milan. Losing defensive stalwart Rony Presner to Real Madrid for £80m was a bitter pill to swallow at the start of the season. Hes been such a key player for us for the last 6/7 years that he was always going to be difficult to replace. Negrete was bought in as a replacement and he had a very good season as we conceded 3 less goals than last year, and thats including the freak 8 we conceded at Roma. National team veteran Giorghetti 21a (92 caps) is being allowed to leave this summer for the good of his career. Hes not been getting enough games and has started to complain, as well as regress attributes wise, hes been sold to Lokomotiv Moscow for £21m. 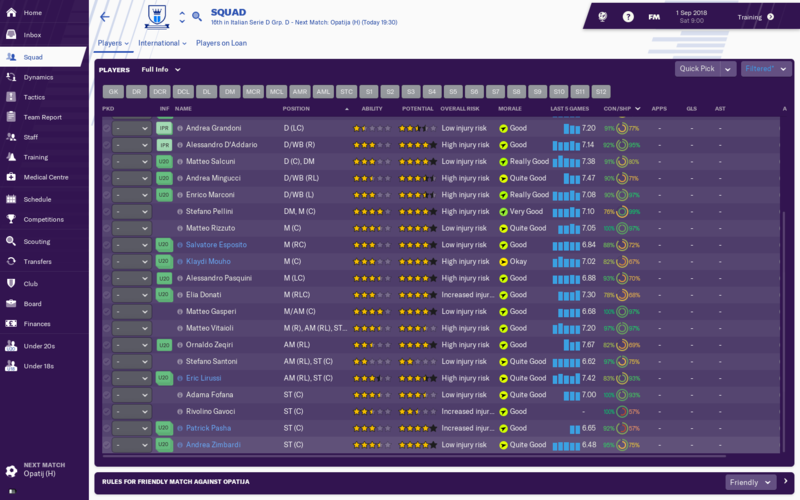 Its gonna be quite a big summer for us, as you can see in the squad list, we have 8 youth products in and around the first team, and am hoping to bring through a few more through this season. Ideally, id like to field a full homegrown 11 in at least 1 game next season. Nothing to shout about here really. We are crying out for a striker in the national side, so either of the two STs here may be able to improve us in a few years time, but noone here will have an impact in the near future. 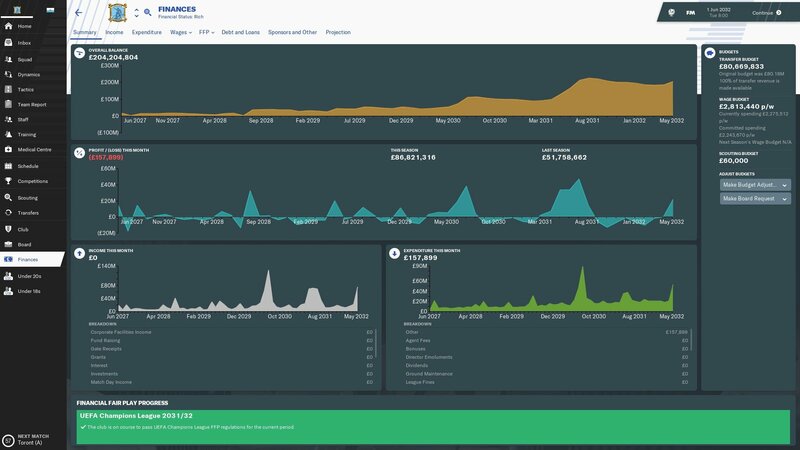 Finances are looking healthier every year, and with us banking £48m net profit from transfers in the summer. We are due to move back into our 24'015 seater stadium this summer, and I will be pushing to expand ASAP. To keep on developing the youngsters and try to win back the league from Milan. To freshen it up i shall be operating a Sammarrinese only policy from now onwards. By this i mean anyone currently at the club can play, but i will no longer be signing anyone who is not eligible for the national side. EDIT : Apologies ive somehow deleted my screenshots on the steam cloud when having a clean up of my pc. So all previous posts with screenshots are now un-viewable. I thought that I'd give this a try; been on CM/FM for a long time, but never tried the San Marino challenge. So, I've started off as a badge-less, ex-Sunday League footballer.That's what I am after all. 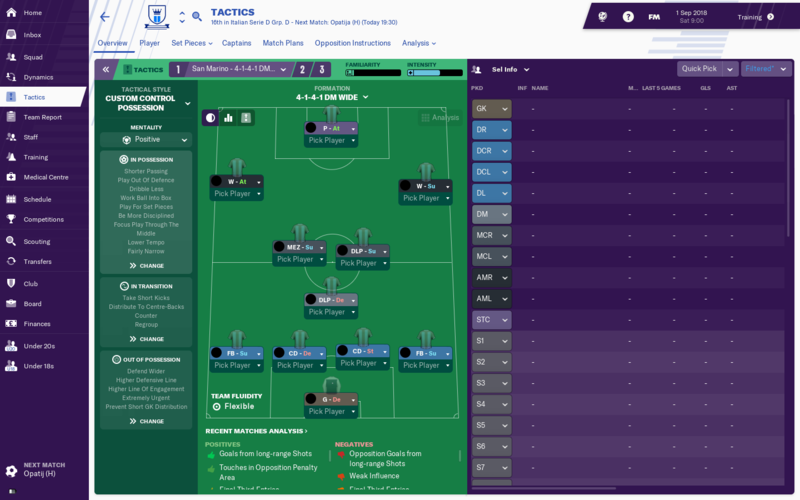 After analysing the team, getting the right staff, loaning a load of youngsters from Serie A, I've got a team that (in theory) should be competitive. I'm going for a 4-1-4-1DM Wide formation, trying to control possession. I'm excited about Terrenzio and Penna at the back, and hoping for some clean sheets to drive us up the table. At the other end of the pitch, I've gotten Vitaioli back for a stint, and will hopefully provide some goals, and hoping that he feeds Fofana, especially after Vassallo threw a tantrum about being replaced and wouldn't listen to me!! 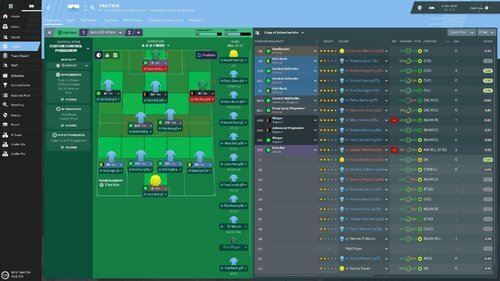 Got a huge squad, but hoping to use friendlies during the week in place of training; not being professional is going to be tough. 1st January 2019. Second in the league, unbeaten in the league, out of the cup, and finances bleeding out the ears. Things could be worse. Conceding 6 goals from outside the area is a real kick in the teeth though. So far, Vitaioli has played 4 games for me. He was injured in the last game of preseason with a twisted ankle for four weeks, and then decided to break the same ankle 6 weeks later. He's ruled out until March, so hoping to rely on him for some fresh legs at the latter part of the season. Looking forward to how the rest of the season unfolds. Gone top of the league, had a bit of fortune with results. Of the 16 goals conceded, 10 have come from outside the area, 2 pens, and dropped 12 points from winning positions, 7 goals coming 85mins+. So frustrating; could be 13 points clear instead of the solitary point. Thinking of re-jigging formation as our backline don't seem to value clean sheets. 6th March 2019 - Youth Intake Day. First impressions; better than expected. No one who can jump into the First Team yet, obviously, but I'm excited about Albani. Hopefully he'll choose San Marino as his international side, but in any case, it's too early to see how he'll progress and how he stacks up as he goes up the divisions. Last game of the season, in second place. The 1-1 draw in the last match was awful. Absolutely killed them, but couldn't score for toffee. And yet again, another belter from outside the box stole some points from us. I think we're the unluckiest team in the competition. SUCCESS!! 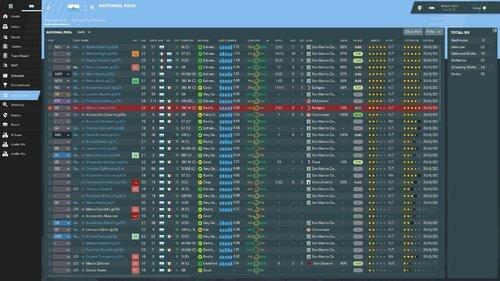 It wasn't easy, it wasn't pretty (well except for Visconti's wonder goal to ensure the final victory), and we certainly made it hard for ourselves, but The Titani are back in Serie C.
Lirussi, AML, on loan from Udinese, 29 apps, 11 goals, 4 assists, 82 % pass success rate at 7.11 - had a bit of a poor end to the season, but on fire at the beginning. So proud, but also know that the next season is going to be ridiculously tough. We've got no money to spend, four Serie A teams hate me for not using their loan layers enough (hey, when you're playing well and get defeated once in the season, you keep your team), and some of our better loan players aren't coming back. But we'll give it a go, and see what we can do. Solidarity is the primary objective next season, if we make the playoffs, and/or get promoted, that's a bonus. This was another very exciting season in terms of title race. For the third season in a row, it went down to the final day. This time, however, we were victorious after a nervy 2-1 win at home against SPAL, in which we were down at halftime 1-0. We did not do so well in the Champions League this season, comfortably finishing second behind Barca in the group stage. 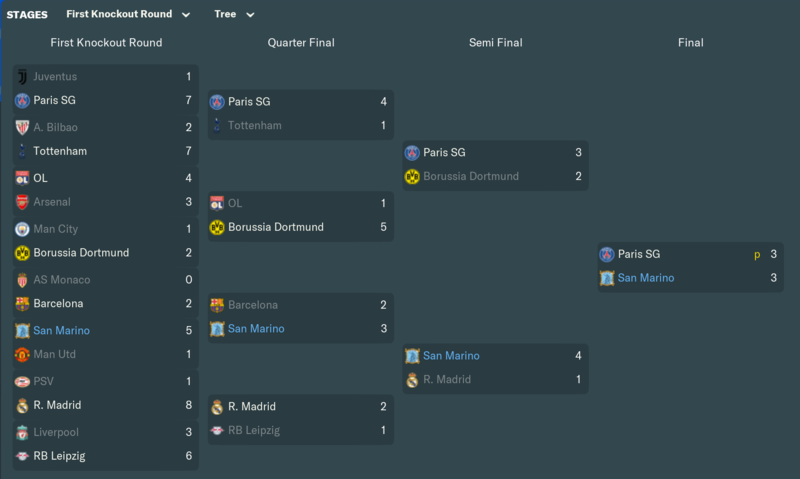 Got lucky in drawing Lyon in the Round of 16, but then lost to Dortmund 3-1 on aggregate in the QF. 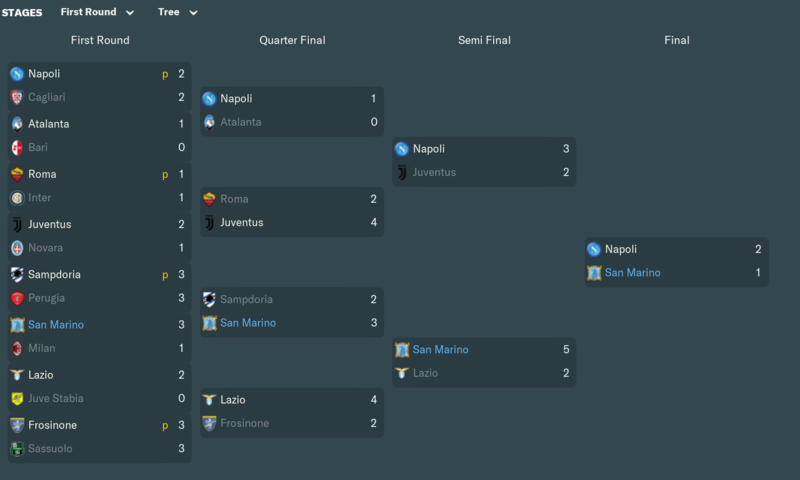 In the Coppa Italia, we lost at home to Lazio in the QF (curiously Genoa of all teams ended up winning the Coppa). A highlight of the season was that our 20 year old dual-national striker, on loan to Roma, ended up finishing as the top goalscorer in Serie A. He'll definitely have a part to play in the first team next season. Speaking of next season, we are going all in on Champions League, and we've already wheeled and dealed quite a bit in the transfer window, including signing Donnarumma on a free transfer from Milan, as well as a new DM for $80M and a new left back for $120M. 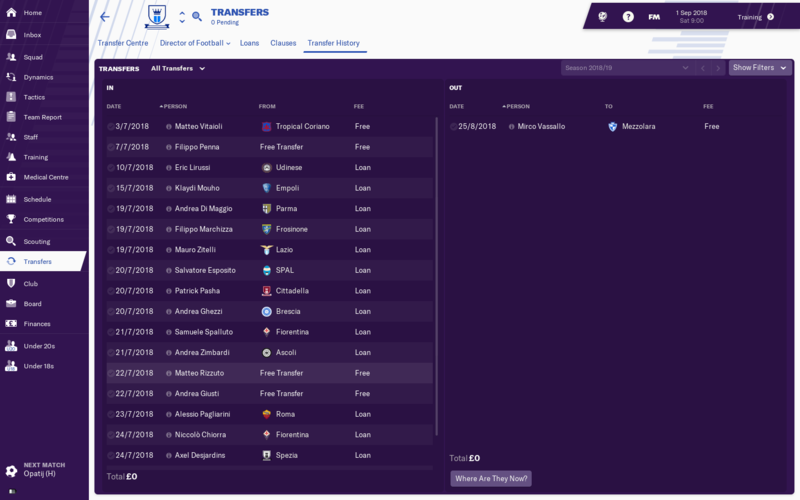 We had to sell a bunch of players in order to raise the transfer funds, but none of them were even starters so I think we will be better off with the new signings. For the first time in a while we got a decent youth intake. Ugolini looks awesome. However the national team is in dire need of some CMs. Another mixed bag of a year. We performed really poorly in Euro 2032 Qualification, and we even finished behind Georgia after a ridiculous 4-3 home loss to them. One highlight was beating Norway 1-0 at home, which is the first time I've seen one team get 3 red cards in a game on FM (although two of those were in second half stoppage time). Somehow we qualified for the playoffs, and after reading the rules online I'm still not sure how that happened. In any case, we beat Greece in the semis before getting dominated in the final by Ireland, eventually losing 2-0. 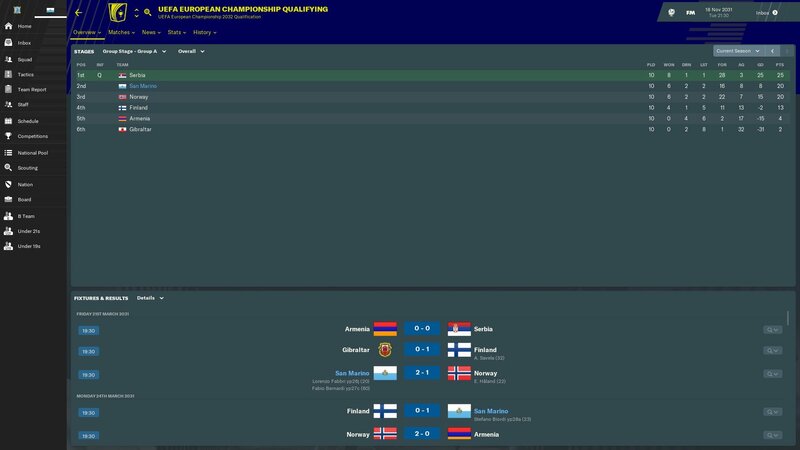 One bright side of qualification was that both Finland and Albania qualified directly for the tournament, which makes our recent performance in Nations League look a bit better than it had at the time (we finished second in a group with Finland and Albania). For the next iteration of Nations League, we drew Hungary and Bosnia & Herzegovina. We've had lots of success against Bosnia in the past, and Hungary is a team we should be beating, so I think we have another great chance at promotion. 1st January 2020. Third in the league, defeated once, but drawn too many games. Out of the cup which wasn't an issue for me; the league was always the priority. Our finances are a lot healthier than I expected, but then we've not upgraded any facilities, kept our coaches on pretty much same terms, and kept a lot of players on part-time contracts. We're playing really well, and dominating possession in most matches. We've a strong settled back four, with Pellini shielding, and it's paying off in terms of results. Long may it continue!! Just a shame really that our strikers and wingers are too inconsistent. 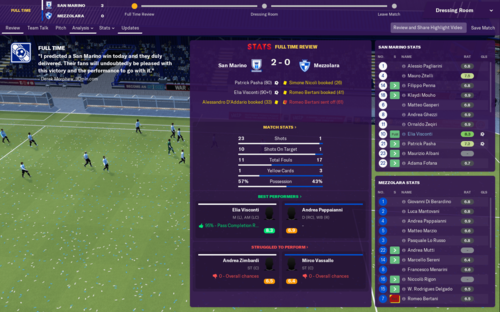 A really bitter sweet campaign for me, we showed just how much progress has been made by finishing 2nd on 20 points. But we still failed to qualify due to being 9th in the second placed table. I am happy with this though, its still too early to qualify in my opinion as we still don't have an amazing squad. We really should have had 2 more points as we faced Armenia in the penultimate game and could only manage a 1-1 draw. A win there, and we would have qualified. In the middle of the park, we have a decent amount of options. This is why i have been playing with 3 cms, just to fit our strongest players in. The top 3 in the national pool shot all want to play for Italy, Righi 26a and Ceravolo 25c will more than likely play for them but Valentini 25b is nowhere near the Italian squad so fingers crossed with him. We lack any depth apart from Cm so still have a long way to go to. We are however up to 92 in the world rankings. We have a couple of friendlies lined up against teams just outside the top 50 so hoping to continue to climb the rankings. With the nations league returning next year, depending on our draw, promotion could be a possibility. Another season winning plenty of silverware. 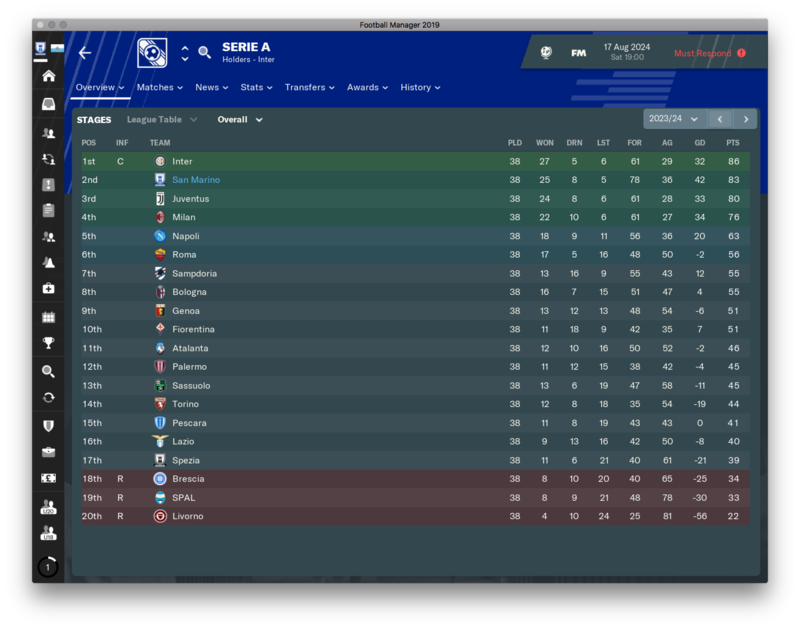 We managed to wrestle the league title back from Milan and secure our third successive Champions League. We really struggled early on in the Champions League, scraping through the group stages with 2 wins and 4 draws. In the League it was pretty straightforward, we led the pack from November through til the end of the season. We still can not win the cup though, I really dont understand why, but we are simply ***** in this competition. 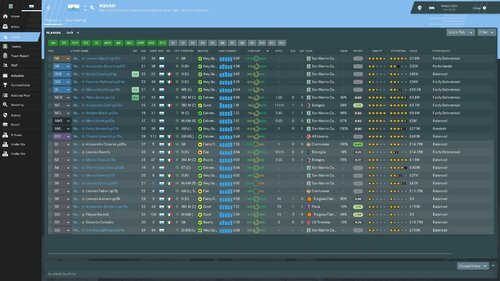 I played my first team this season, when usually i would be resting a few for the cup games, but even then we lost to Pescara, maybe next season. A great year with lots of development. Ceravolo 25c scored an impressive 11 goals in all competitions, taking the goal scoring keepers tally to 23 career goals. Righi 26a finished as the Serie A top scorer on 22 league goals. This season was a breakthrough season for HG Cb Valentini, he looked like he may not fulfil his potential, and I was hoping to get him to play for the national side due to this, however he has been called up by Italy twice this season so I am less hopeful now. 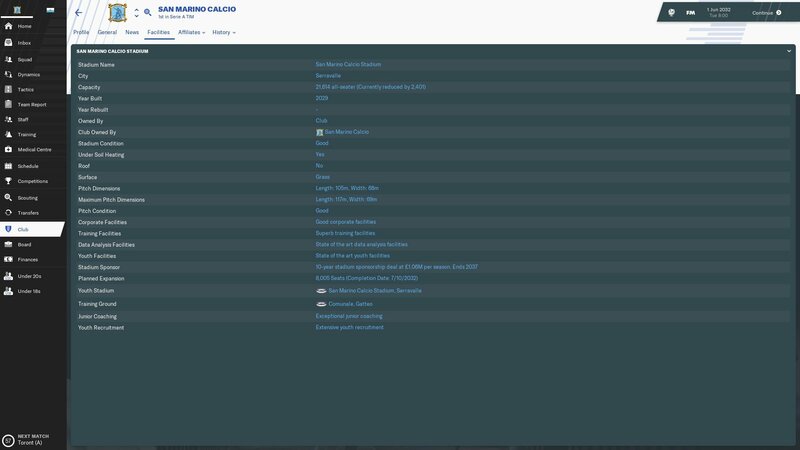 With my focus now on developing Sammarrinese players only, we made no signings this season. I'm not just selling everyone else, but will gradually faze them out when I can. 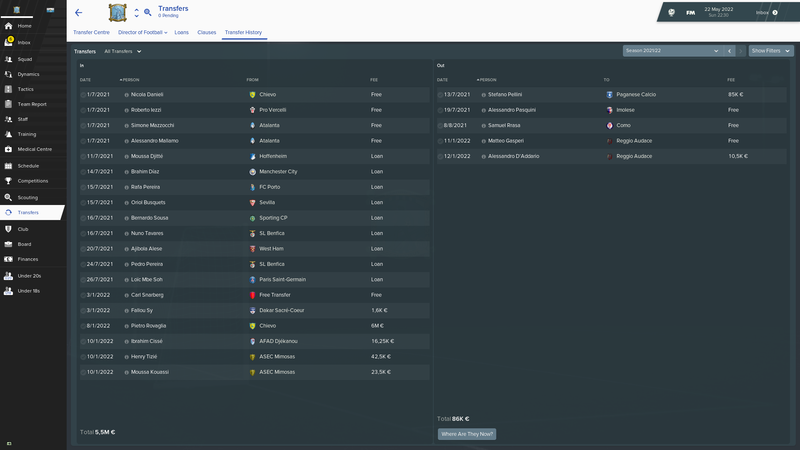 I am also not ruling out ever signing anyone again, as I will dip into the transfer market, but only if I have to. For example, we already have 2 excellent left backs, but one will be moving on this summer, you will see why below in this years intake . We allowed 2 of the national sides first choice players to leave this year. Moretti 20b joined Napoli, he was the club sides back up keeper and needed games, as did Cb Giorgetti 21a. They are both now playing every game, so bodes well for the national side as well as their own development. 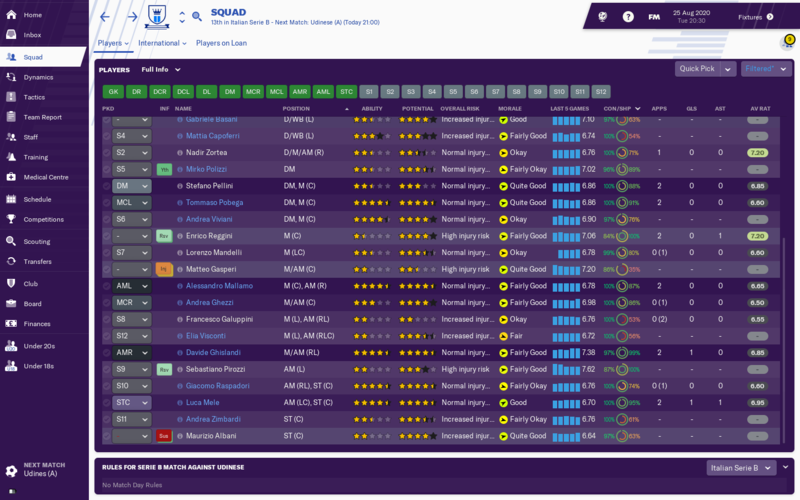 We have 6 HG players currently performing regularly for the club, Id like to add to that this coming season, but minus the new Lb, we don't have anyone who is first team ready as yet. 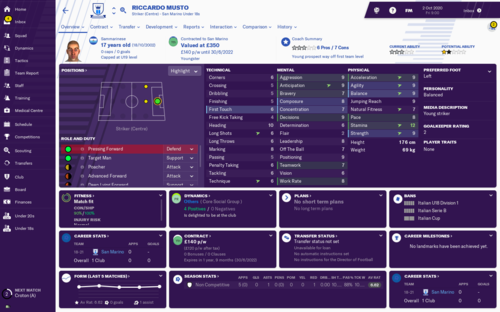 On another note Ceravolo 25c and Valentini have been called up by Italy for this summers Euro's whilst Serie A top scorer Righi 26a missed out, even so he has still refused my attempts to play for San Marino. We had a run of two poor intakes, but our last 2 have really produced. This year we got the brilliant looking Lb in Alex Di Angelis 32b, who is single Nationality, he is going straight into the first team as 2nd choice next season, amazingly, he wasnt even the highest rated potential wise, Rm Nicola Ercolani 32a was, with a driven personality, he is much more raw than Angelis but will be interesting to see how he develops. Im now only tagging the San Marino eligible youth players, if any of the others develop, they will be simply sold on. The club is very rich nowadays, with fantastic facilities for the seniors and youth sides. This was the first season in Serie A that we actually lost money some months though, This is down to the wages getting pretty high. My top earner is now on £185k a week and we have 9 players earning £100k a week or more. With other sides paying £300k a week though, we still have a reasonable wage budget for the current climate. More importantly, we are again expanding the capacity of our stadium, and I think this will max it out. The stadium was built in 2029, so we are playing here until at least 2049. Its not a bad size stadium at all, and looking on google, San Marino has a population of 34'000. So we need near on everyone to fill the stadium out, although im sure tourists are coming from all corners of the globe to watch our beautiful, free flowing football. Would be nice to get a few more home grown youngsters into the first team picture, we have a lb who looks the part, aswel as 2 cms out on loan who could come back and play, but Cm is a position we are stacked in, so may involve moving someone on to make room. 13th March 2020. 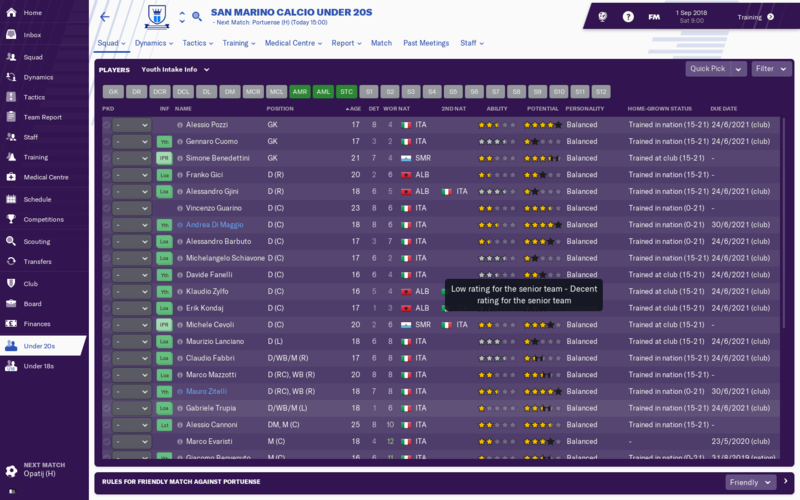 Big day for Maurizio Albani; the 16 year old dual-nationality striker (who came in our first youth intake) has been called up to the San Marino national team. It might have something to do with him playing the last three games in Serie C, and playing pretty well. Bearing in mind just how terrible the Sammarinese front line is, I wouldn't be surprised to see him start the match. 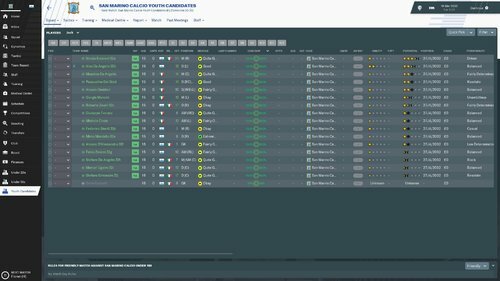 15th March, youth intake day. And for the second year in a row, a potential 5* player has come through our ranks. 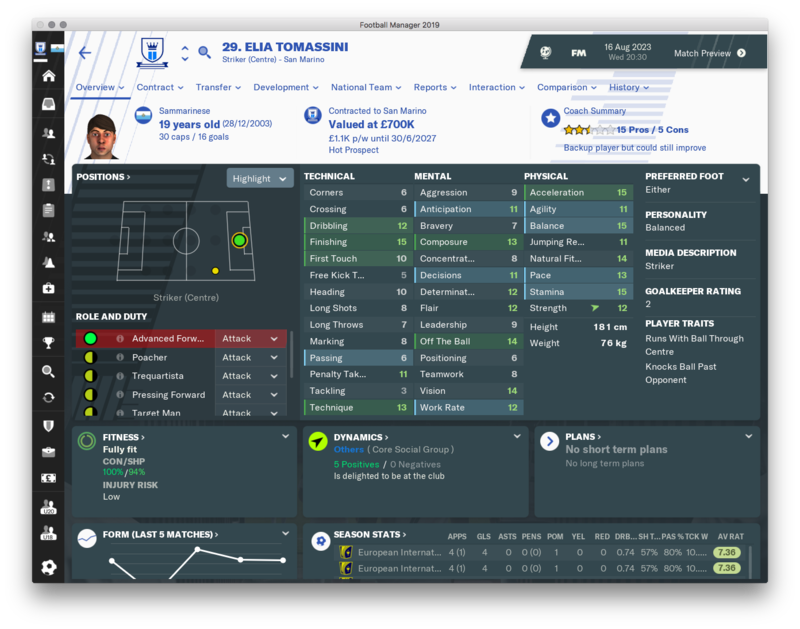 He's dual-nationality, but I'm actually pretty excited by his potential. His mental stats are pretty high for a 16 year old, has pretty decent attributes for a young midfielder. I'll keep him close, and beef him up. Who knows, maybe he'll be starting for me in Serie B next season!! 22nd March 2020. A goal on his international debut. Let's see just how high he can go!! 1st April 2020. This is going to be tight. A poor run of four consecutive draws has put a real dampener on our momentum. We're 3rd in the league, but again, the amount of draws we're dominating could have made this a lot more comfortable. 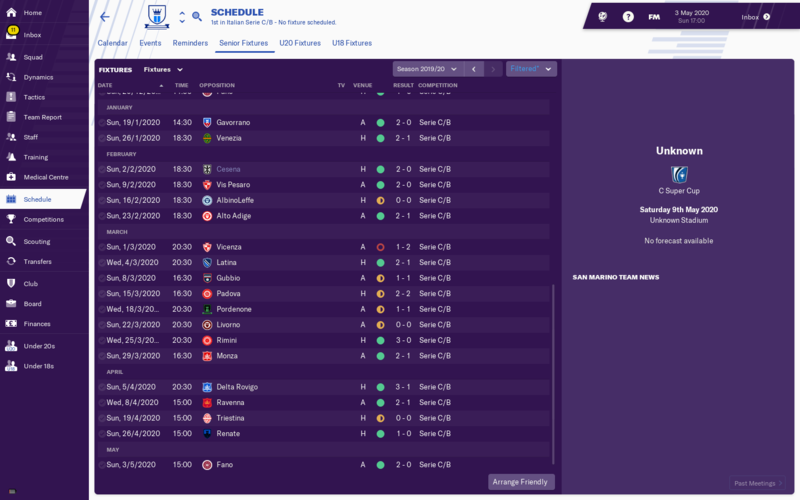 5 games left, three of them at home, and the away games at 15th placed Ravenna, and 18th placed Fano. Really think that we should be ending the season on a positive note. 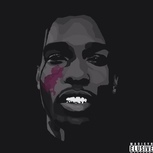 26th April 2020. Second in the league, one game left to play. 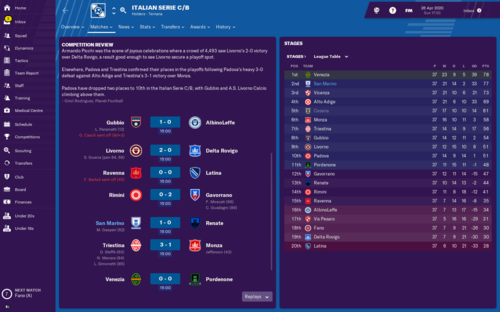 Just had the perfect day (almost); Venezia in third lost and are out of the title race, Matteo Gasperi popped up with a rocket to give us a 1-0 win, and Pordenone held Venezia at home 0-0. In a ding-dong season, it goes down to the last day. Again. SUCCESS, AGAIN!! 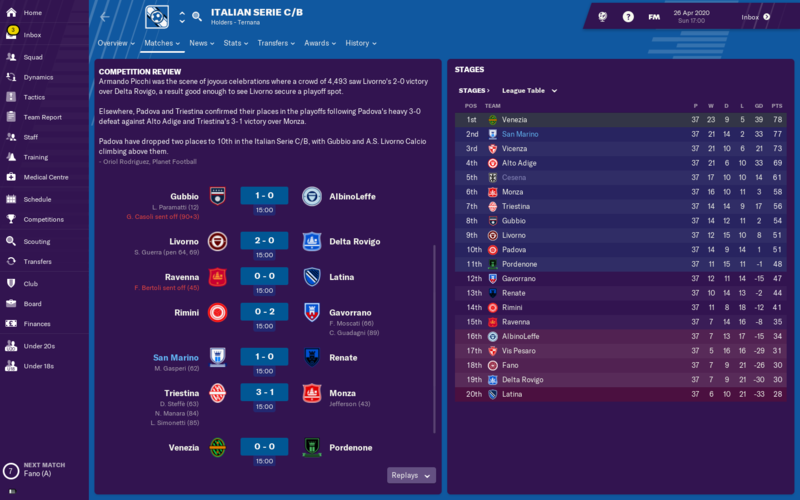 Our 2-0 win was enough to win Serie C after Venezia drew 1-1 at Renate. A thrilling end to the season with 6 wins in our last 7 games, in a title race going down to the wire. Clearly, our attack needs significant upgrading; our top scorer had 11 league goals in 30 games. Our midfield was pretty disappointing as well with only 8 goals from the centre of the park. 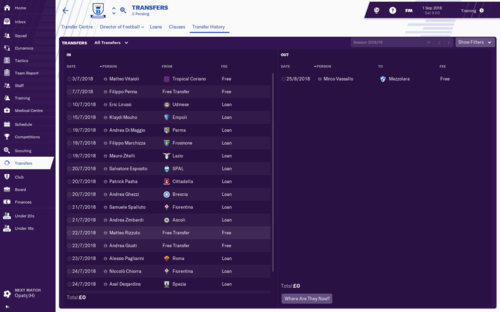 We're on the hunt for a leader for next season, so as our midfield needs an upgrade in that area, I'll be spending a bit of money on a permanent transfer. Obviously, we'll be relying on some loans to get us through the season. I thought Serie C was going to be tough, and it was, but Serie B is going to be a whole different kettle of fish. We've major work to do. 5th June 2020. 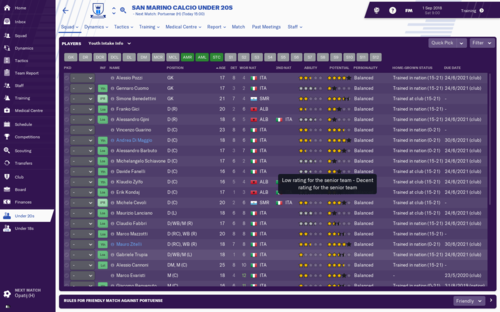 My 16 year old 5* potential centre midfielder Enrico Reggini has been called up to the San Marino national team. Playing four substitute games in Serie C means they must be setting the bar low, but if he develops into a great player alongside Albani, they could have a special partnership in the national team for a long, long time. And he's a full International for San Marino. 25th August 2020. The day we start our Serie B campaign. 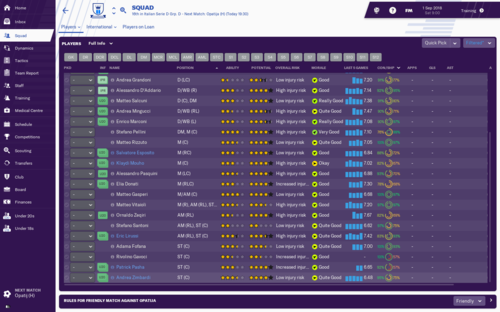 We've had an active transfer window, with lots of loans for the first team, and squad players on free transfers. Obviously I'd prefer it the other way around, but our finances are absolutely dire. We're haemorrhaging money and until we can start turning a profit, we'll always be overachieving. Again, our team looks fairly decent, and we should be able to at least stay in Serie B. Another solid year for the national side, winning promotion in the Nations league from League C to B. Drawn in a group only featuring 3 teams, Ourselves, Israel(81st) and Georgia(84th) I expected a tighter group, at the same time we have beaten both sides a couple years back and are a much better side now. 3 wins and 1 draw meant we topped the table. League B will be alot tougher though, with teams like Serbia, Sweden just some of the names playing at that level. The short Nations League campaign meant I was able to organise a few friendlies, and I tried to face sides ranked around 50th-75th in the world, so not major tests, but against sides ranked better than ourselves, with the exception to the June games. We was lucky to beat Hungary and the loss to Morocco was a fair result. The 3-2 win over Scotland was a great game, and to smash Hong Kong was unexpected. This has seen us rise to a save high of 82nd in the world. With a world cup qualification campaign next season, we can really test our progress again. 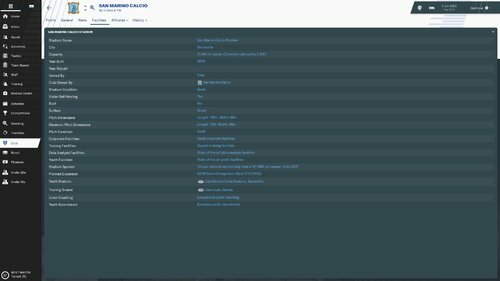 I have done a longer post with a breakdown of the first 11 etc in my career thread, if you want to check it out there, dont want to clogg up the challenge thread with two many screenshots. Well, this is a turn-up for the books. 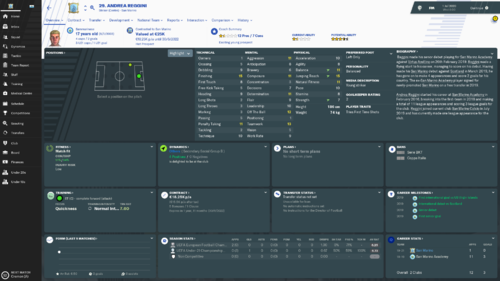 I decided a couple of years ago to give a contract to a greyed out striker because hell, why not. 18 months later he's been called up for the San Marino U21's!! Yeah, he's not great. I just thought, stuff it, I'll give it a punt. 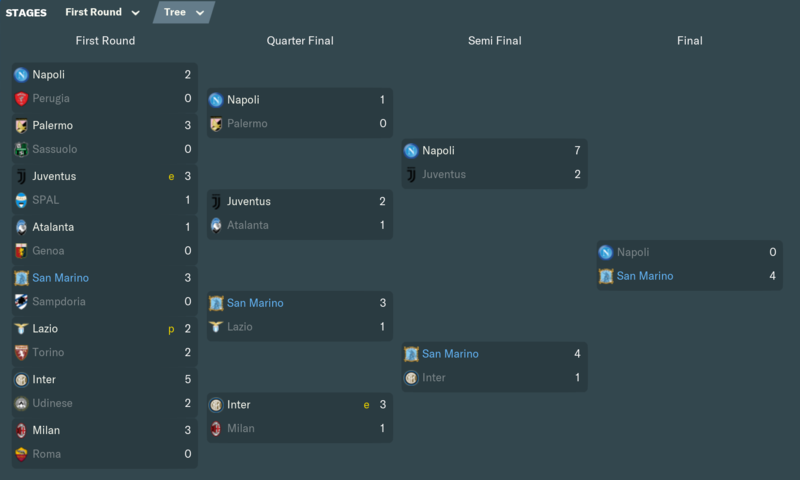 We FINALLY managed to secure our first Champions League title, and came so close to getting the elusive treble, but lost in the Coppa Italia final to Napoli in a fairly even game. Unlike the past 3 years, where the league title was decided on the final day, we walked the league this year and had a huge gap at the top (mainly due to the ineptitude of other teams - we only had 3 more points than last season). We also won the Supercoppa with a 3-2 victory over Genoa. 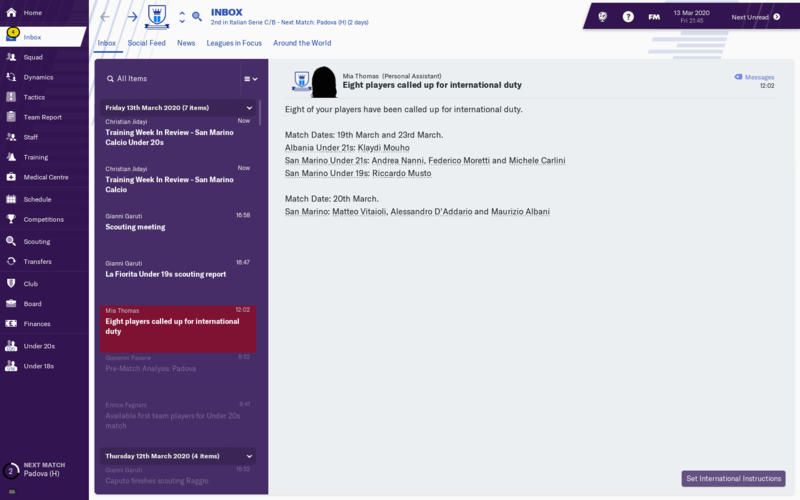 We now have a trio of Sammarinese strikers leading the line (I alternate between 1 and 2 striker formations so this is a rotation), although 2 are dual national, one of whom is already cap-tied to Italy, but this is still a nice highlight. Now that we have won the Champions League, I will be adopting a similar Sammarinese-only policy to @Lewis89: I will not be buying any players that are not Sammarinese, though I will allow non-Sammarinese already at the club and non-Sammarinese youth products to play. We completely dominated this competition. As evidence of this dominance, in the competition (group stage + knockout), we scored 28 and conceded just 3, including a combined aggregate score of 15-1 in the knockout stage. We also went through the whole competition without losing, drawing just twice (1-1 away to both Dortmund and Spurs). We had a nice path to the final from QF onwards, but ultimately came up short in the final, where we conceded a 91st minute goal. 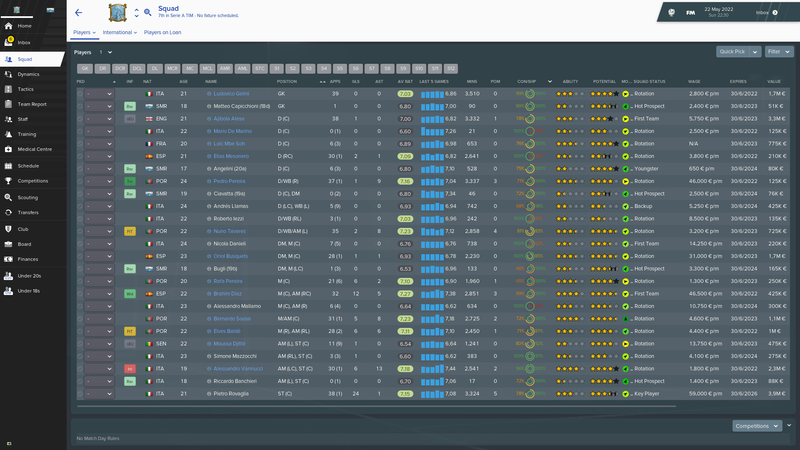 Definitely the best youth intake over the past 5 years. Too bad the best of the bunch are dual nationals, but I have hope that Carlini will not be good enough to play for Italy. Given the dire state of the CM position for the National Team, I will try to retrain him as a CM. A bounce-back year for us after a couple of below average years post 2030 world cup. We won promotion to Nations League B, and we are doing pretty well in World Cup Qualification for 2034, though we have a really challenging group and it will be almost impossible to qualify. We also secured our finest ever victory, defeating the Dutch at home by a scoreline of 2-1 (despite our best player getting injured in the second half). Despite the positives, we ended June on a down note with a poor performance in a friendly against Lithuania, drawing 0-0 at home. We've also now hit our record high world ranking at 93. And there are two dual nationals (one age 24 the other age 25) who have been called up by Italy but yet to be cap-tied (one has played in a friendly). 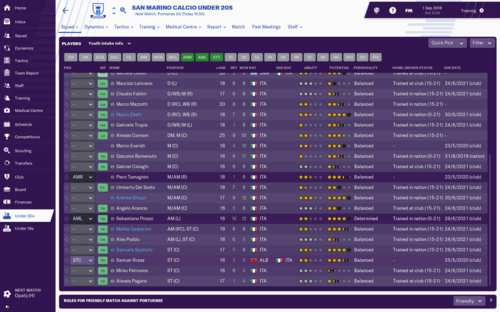 I really hope we can get them to play for San Marino before they get cap-tied by Italy. We dominated our group, winning every game except away to Bosnia, a game which we also dominated but somehow ended up losing. This is an absolutely murderous group, with Switzerland, the Netherlands, and Serbia. 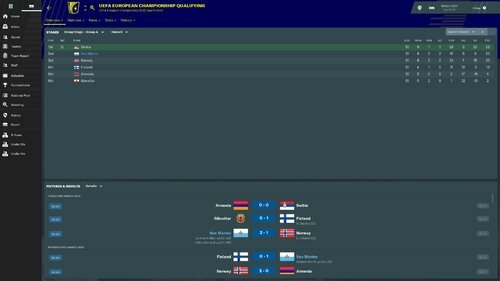 We easily beat Estonia away 4-0, followed by an unlucky 3-1 home defeat to Serbia (it was a very even game). 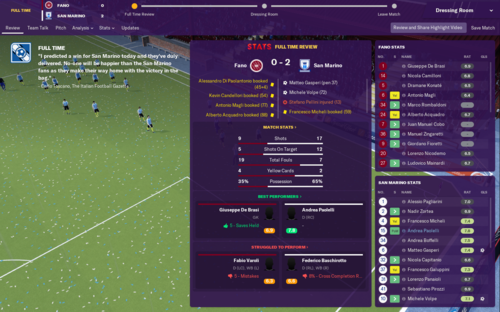 Our third game was the aforementioned 2-1 victory against the Dutch, and we definitely rode our luck a bit and nicked it at the end with a 91st minute winner. Probably our finest ever victory, though I think our finest ever result remains the 2-2 away draw against France in last WCQ cycle. A solid season in the league. I didn't expect us to push for the title again, but ended giving Juve a respectable challenge. We could've finished top or fourth with about five games to go, but managed second place. Looking forward to the extra CL money coming in again next season! We did better than I thought in the CL. We managed to top a strong group against Galatasary, Benfica and Monaco. It went down the final fixture and we could've easily ended up in the EL knockout stages, but a 3:3 home result against Monaco secured us top spot. 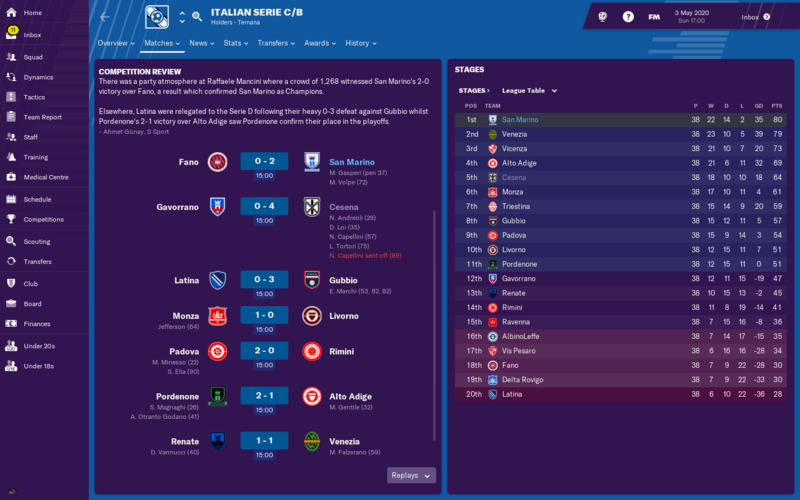 Another poor run in the Italian Cup. 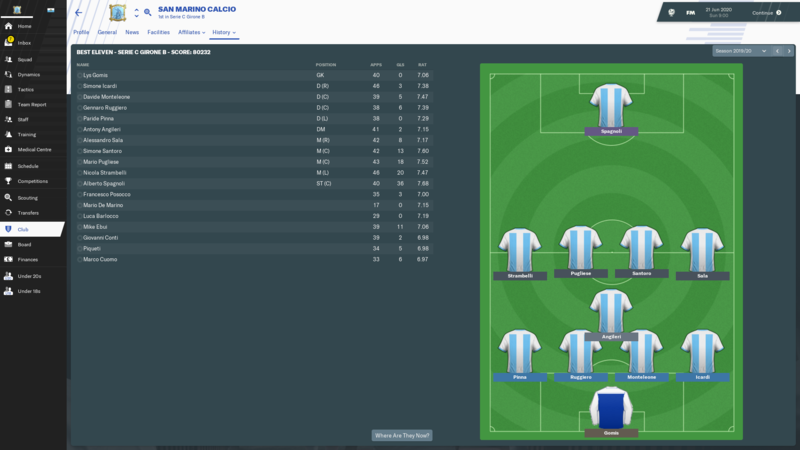 We were dumped out in the QF with a 4:0 away loss to Palermo. I hope to do better than that next season! More upgrades completed and more on the way! The club is comfortably rich now so the board have no problem upgrading all areas when I make the requests. We've sold a couple of youngsters we've had a few seasons for huge profits (most notably Mateo Pérez, who went to Arsenal for £35m after signing him for £525k two seasons earlier). We currently have excellent training facilities, good youth facilities, exceptional junior coaching and extensive youth recruitment. We're also due to move into the new 17,069 seater stadium at the start of next season. I'll be surprised if we don't sell it out and end up expanding it at the first opportunity. Another few nice players coming through again. De Angelis (single nationality) should be a solid RB for a good few years for the national team. He might also be the smallest player I've ever had! Andreini (also single nationality) is also going to be useful as RM in internationals. I'll try and give these two some time from the bench to help them develop. Giacobbi and Zanin are duel nationality and are refusing call-ups. That's five players in that position now. Challenge for the title and try to get to the QF of the CL. Semis of the Italian Cup would be nice too. We have a lot of good young players now so there's no reason we can't become a very strong team over the next few years. We finished second from bottom in our Euro Qualifying group with just three points. A single 3-0 win against Latvia ensured we didn't finish bottom (we ended up with a better goal difference than them). We've won our last four friendlies in a row now. Malawi (149), Haiti (81), Oman (91) and Jordan (103). We beat Malawi 6-0 and Jordan 6-1. Has anyone had a player reverse their decision to reject an international call-up? I have had a couple but none of them were ever going to be good enough to play for Italy anyway.